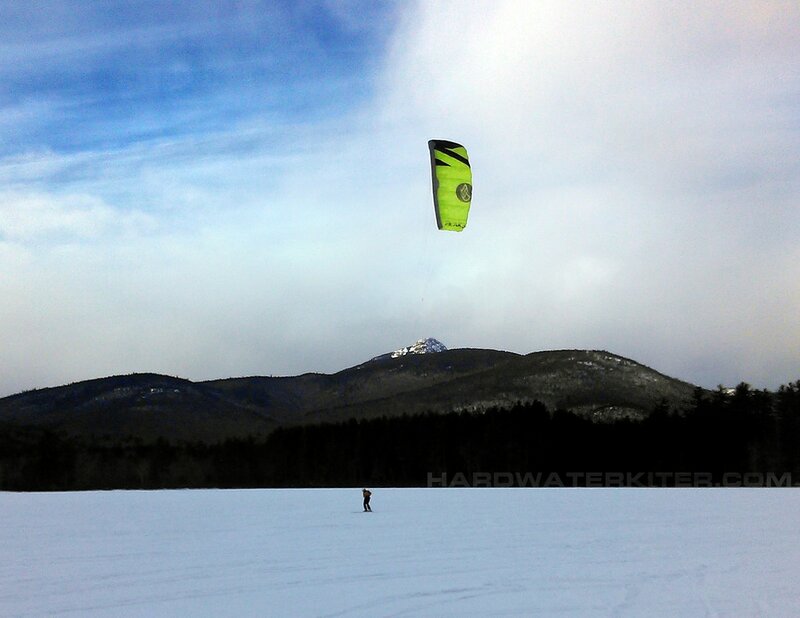 Hardwater Kiting has been selling single skin depowerable kites since they were first brought to market. An unusual design, we saw the potential and benefits for our type of kiting and they have proven to be both popular and successful. GIN Kiteboarding introduced the Shaman series last year and and we had heard a number of good things about them. There were also detractors who claimed (due to obvious similarities) that the Shaman was little more than a clone of the Flysurfer Peak. And although there are strong similarities, GIN had managed to take what we felt was a very good design and improve upon it. The results were a kite that retained the benefits that the single skins offered but elliminated one of the biggest issues that single skins have. Depower flutter. Gin added closed cells to the tips. Making depower flutter all but vanish. This took the single skin design to a new level and put it much closer in flight quality to traditional dual skin kites. Thus reducing rider fatigue over long sessions and making the kites just overall more enjoyable to fly. When we got word of this from customers of ours who had previously bought single skins from us but opted to try the Shaman as their next single skin addition, we were intrigued. Fast forward to now. GIN has since made further improvements on the Shaman and released the Shaman2. For example changes in bridles to enhance turning, additional reinforcement of bridle anchor points. Theses just add to the overall quality of the kite and how it handles. Given that other companies had adopted similar features to the Shaman, we figured GIN must be on the right track. 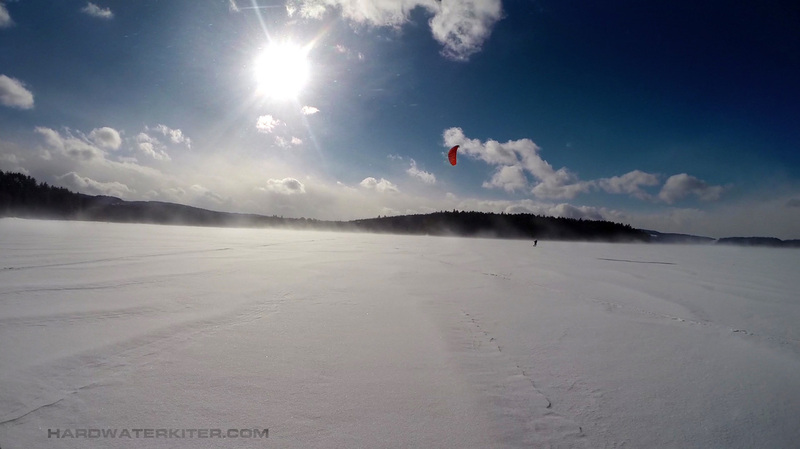 Hardwater Kiting specializes in foil kites. So we decided maybe the Shamans would be a good fit for Hardwater Kiting and GIN agreed. The GIN Shaman2 comes equipped with a 5th line safety system installed. It works by engaging an independent dedicated bridle assembly that is attached to the leading edge of the kite via small additional yellow pigtails added to specific bridle points. When the safety is activated the 5th line tethers the leading edge while the rest of the kite goes slack. The kite loses power and as you would expect, falls out of the sky. In our tests it tended to roll over in the process and land with the "top skin" down. Even in 25kts+ the kites tended to simply lay there unless there was a substantial shift in wind direction and even then it did nothing to cause alarm. The GIN Iced V3 bar is a direct fitment to this 5th line and installs in seconds. Much, much easier than other 5th lines we've dealt with. If you don't want to use the 5th line safety or don't have a bar with a 5th line the 5th line bridle is easily removed and you can use any FLS (Front line safety) to flag the kite out of a single front line. Both systems work very well and reliably. The Shaman2, if equipped with the GIN Iced V3 bar, also comes with a stall handle attached to the outer lines. In my opinion this is an invaluable feature for adding easy to launching and landing the kite not to mention a quick means of securing it for short periods if needed. All of our bar offerings come with these and they are a simple but great tool for managing your kites on the ground without the need for activating the safety. In a word, NIMBLE. The Shaman2 is just flat out fun to fly. The inherent stability of the kite is excellent yet the kite is still very, very maneuverable. It has very light bar pressure which considering it has single pulley toggles, was surprising. It has almost stunt kite handling traits but somehow retains stability usually only found in slower, lower aspect ratio kites. And even though the kite has an AR of 4.2 it is still higher AR than its closest competitor and higher AR than most dual skins that offer the same level of security and user friendliness that the Shaman2 possesses. Turn rate without any advanced effort is really good. But, sheet in a bit or over-bar steer and the kite can stall turn on a dime while generating ZERO pull. All while maintaining altitude. This is a huge benefit when flying in tight areas or riding the tree line compression. It's also a huge benefit when you simply need to dump power in a gust or at ridgeline or tree line compression. Once you get a feel for it and find that you can put the kite anywhere you want when you want, you start to see things a little bit differently. When looping, the power is steady and predictable. No spikes in power and power is delivered smoothly. Even when climbing in light winds when the power occasionally died off you never felt as though the kite wanted to drop you. In fact the kite's ability to stay airborne, to "drift" when the winds drop off or if you hit a rotor is remarkable. And as long as it has some level of movement and can maintain apparent wind, it seems to be able to generate some amount of pull. This is especially nice when the winds drop off and you find yourself skating. the kite will remain in flight in almost nothing and even give you a little bit of pull to assist your skating efforts. This helps a lot if there is a sudden wind shift and you find yourself out of the wind and needing to move to where the wind is and don't want to do a "walk of shame". Also, the power delivery in corners can be made constant. This takes some practice but when you feel it, it's amazing. Depower on these kites is as expected and excellent. Very confidence inspiring. Turn rate is affected very little when trimmed. The most obvious affect was found on the 12m with some lag in the turn. Again, sheeting in while turning offsets much of this. Advanced riders will find that the Shaman handles well beyond it's posted wind ranges. Unlike many other single skins there is nearly ZERO bar feedback or flutter when fully depowered. Even when fully trimmed. And you can dump amazing amounts of power just by sheeting out. Trim is almost unneeded unless you really get into some "rough and tumble" conditions. This results in a kite that is just flat out fun to fly in every condition we fly it in. There were light wind days when the 12m out flew 15m and 18m high AR, high performance kites. Light wind kiting is generally the most expensive due to the size of the kites needed and how they are made. The 12m Shaman2 really brings light wind flying costs down. Speaking of wind, the wind ranges are broad. For example during one demo session I had riders flying the 6m, 9m and 12m all at the same time. They were all able to match power and fly in the same conditions which weren't especially windy. The overlap in sizes is pretty substantial in my opinion and as nice as it would be to have a full quiver of Shaman2s, I honestly feel that 2 kites will cover 75% of anything you would ever want to do. At 185lbs I would be pretty well covered with a 6m and 12m. Changes in line lengths or additions of line extensions will expand the wind ranges of a given size even further. This in addition to the light weight and ability to pack down make these kites great for travel. For example I can fit the entire size range, 4-12m and a 54cm bar, in your average 7m dual skin kite pack. It's like the kite storage equivalent to a clown car. Historically single skins have not been especially good for jumping. As a touring kite, lift is not generally a desired trait as you want to be powered, be able to ride gusty conditions with minimal risk of being lofted accidently. This makes for a good touring kite but also for a good beginner or school kite. However, most of these kites can be made to jump although the timing is often different. This said, the Shaman2, especially in the 9 and 12m sizes, is actually a very nice solid jumper with jumping tendencies very similar to a dual skin kite. And yet it still retains the ability to just dump all lift at will. The 12m at the top end of its wind range is really fun to jump. The Shaman2's Lift/Drag ratio is not on par with higher aspect kites but it does surprisingly well. I've flown all sizes well beyond their recommended range and at no time did I ever feel like I was at risk of being lofted. But the lift was there if I wanted it.. Stability of the Shaman2 is excellent. In steady winds it is so stable you can hardly believe you are looking at the kite in real time. It looks like a still photo. In shifty and gusty winds, it is obviously less stable but never unpredictable and very resistant to tip collapse/curl that we see in other single skins when there are sudden wind shifts. It sits at the edge of the window quite well. At 12:00 it has a slight tendency to overfly in a gust but not drastically and it can be offset with slight bar input. In flight while moving in conditions where the gust factor is extreme in both frequency and speed, the Shaman2 has a tendency to rush the window edge a bit. Very similar to what a race kite does, but without the violent increase in power. The kite has very good inherent gust handling but in extreme conditions, some active gust management from the pilot does help but they do really well on their own. ​GIN has a reputation for good build quality and the Shaman2 is no exception. There really isn't much that we can say beyond that they are still building solid, well thought out kites and it shows with the Shaman2. Little details like the line keeper tab, the color coded bridles, placement of the logo on the center of the leading edge so you can easily find the center of the kite while packing are all simple but useful build features. Much of the bridling is very thin, much like a race kite but still durable. The Bridling is not complex and very easy to manage. Somewhat long but not unusual for a single skin kite. There are no pulleys, but sheave less low friction rings. This saves weight and reduces the chance of a bearing failure in a pulley. The kite is made from Porcher Skytex 38. One of the more durable yet light weight fabrics with a high resistance to fatigue or porosity over time. This has been an issue that we have seen in other single skins. Not a surprise given how the fabric that will flutter in a depowered state. Between the Skytex 38 and the reduced flutter we feel that the Shaman2 will maintain its flight quality for long term ownership. The leading edge has stiffeners and they are double sheathed to minimize damage that can occur from getting dragged leading edge down. Side note: The kite comes with a small repair kit as most kites do. However, unlike most of the kites I've sold the GINs come with color matched repair tape. Not just color matched fabric, but actual color matched tape. So you can patch the kite without it looking like "FrakenKite". Not that we've had to. The GIN Shaman2 is an excellent kite for everyone from the beginner kiter to seasoned pro. In demo sessions this is the first single skin that we've had nothing but positive feedback on. Truth be told, many of our testers were surprised at how nice the kites were and the wide range of performance they offered. They can go fast (in the 70mph range) and they can fly in darn near zero wind. They deal well with gusts and have depower for days. They are by far one of the safest and confidence inspiring kites out there and I am happy with my choice to use them as our single skin school kite offering. In a world where kites have become more and more expensive the wide wind range and comparatively low cost of the Shaman2 makes it a great choice if you are on a budget but still want modern kite performance. Again, to get similar light wind performance to the 12m Shaman2 you would have to spend almost 3X as much in another model and you still wouldn't have the wind range that the Shaman2 offers. And they are very easily adapted and functional with other bars if you don't already have a bar. I tested them on 3 different bars, both 5th line and FLS and apart from the addition of pigtails, they are compatible. Hardwater Kiting Review of the 2018 Ozone Blizzard V1. 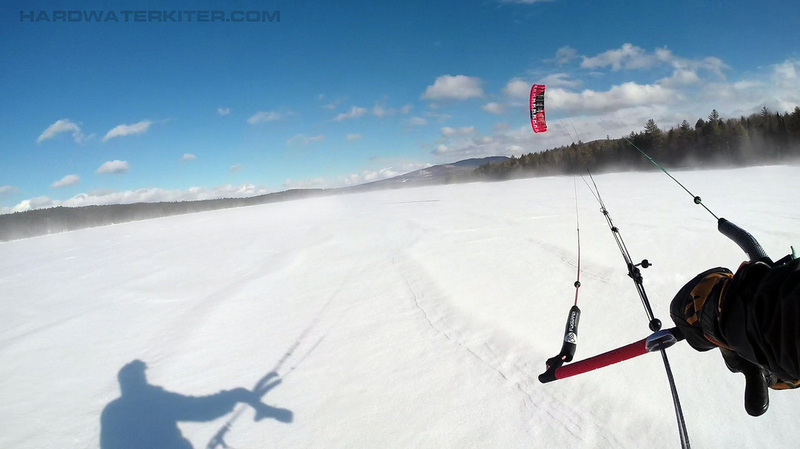 "The Blizzard V1 is a completely new design dedicated purely for snow kiting. Together with our latest design understanding it combines our favorite characteristics of the legendary Frenzy and Summit models into one all-round performance open cell foil kite." When we learned that the Ozone Frenzy series, (arguably the heart and soul of Ozone's snow kite program) was being discontinued we were at best skeptical and worse a bit angry. For many of us in the early days the Frenzy was the "gold standard" for snow kites. 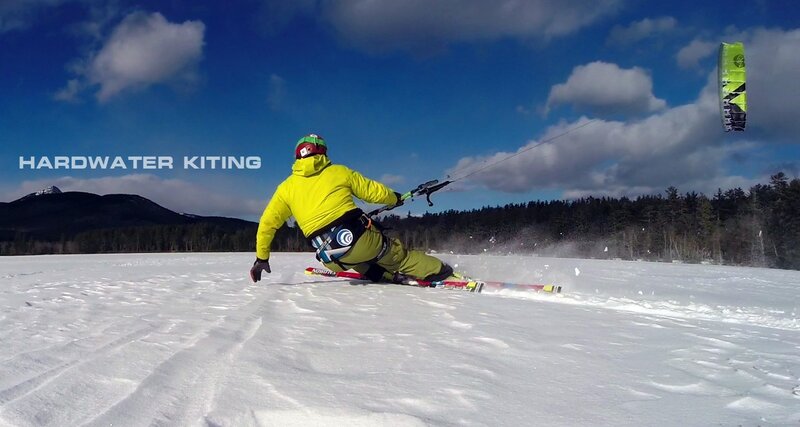 Ozone was the only company that embrace snow kiting as a legitimate segment of kite sport and put the effort into build purpose built snow kites. Locally, almost every kiter we know owned and rode some version of the Frenzy at one point or another. The fact that Ozone made 10 versions, is a comment on the longevity of the design. And then suddenly, it was gone. And with it went the Summit series (essentially the replacement for the Manta) which had just been updated in 2017 to the V4. The two performance focused open cell kites in the Ozone snow/land kite line were gone and replaced by a single kite, the Blizzard V1. We weren't sure what to make of it. Sure we always felt there was some overlap between the Summit and the Frenzy. Personally I always preferred the Frenzy since I had my first one in 2005. And I have to say I felt that the Summit was a bit redundant. It had some slight advantages in some ways over the Frenzy but the Frenzy in my opinion just had better flight quality. Again, this is my opinion and some would argue it the other way but since Ozone has made it go away after such a short run I'm betting they felt the same. I don't know many people who will miss the Summit. But the fact that the Blizzard made the Frenzy go away spurred us want to hate the Blizzard. HOW DARE THEY KILL OFF THE FRENZY?! But here we are after a couple months with the new kite and I have to say, Ozone did an amazing job. 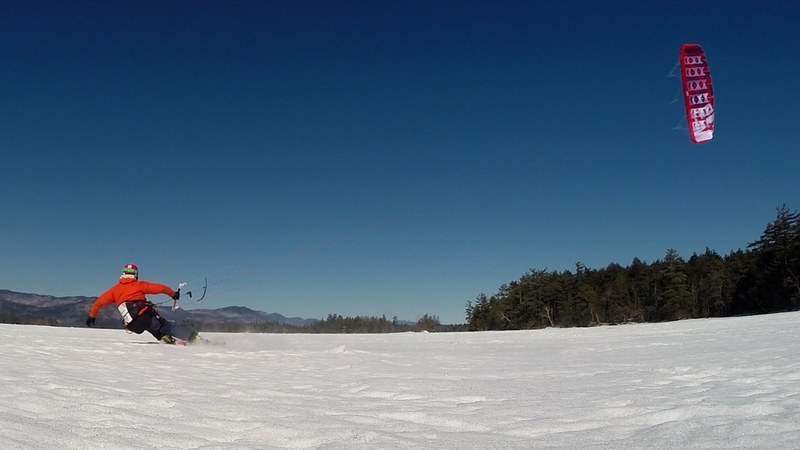 The Blizzard is a PHENOMENAL snow kite. ​ The Blizzard continues to use the Ozone ReRide system that was found on both the Summit and Frenzy series as well as the Access V7. If you aren't familiar with the ReRide it's specific to Ozone snow kites and is supremely effective and shutting down the power of the kite either in an emergency or for simply landing and packing. It consists of a 5th line actuated bridle assembly placed inside the kite that when the safety is activated the 5th line will draw on the internal bridle and cause the kite to fold up and fall out of the sky. As I said, it makes for a great safety system but also a landing and launching method. For example the Re-Ride system reduces or eliminates our need for ice screws. 2. Set an ice screw. 3. Anchor depower line/brakes to ice screw. 4. Secure/pack kite at end of lines. The ability to do this shortens launch and pack down times to just under 3 minutes without rushing. . If you don't want to use the Re-Ride to land the kite the Blizzard still has the stall handle which attaches to both back lines and allows you to stall the kite the same way we have been since 2004. Note: this is the same handle used to reverse launch the wing. The 2018 Ozone Blizzard is simply a joy to fly. It may be a replacement for the Summit and Frenzy series but it doesn't feel like a hybrid of the two. It has no lack of performance but it also doesn't have any surprises. It's pretty well behaved and rally only seems to do what you tell it to. A few of us, myself included have felt that it feels like a high performance version of the Access. I know, seems a bit of an odd way to describe it but the Blizzard has a very comfortable and familiar feel to it if you've spent any time on both the Frenzy and the Access. The turn rate is fast and the turn radius is tight. A bonus if climbing uphill or having to maneuver tight channels on lakes or in close quarter flying with others. The Bar pressure is light, reducing fatigue but still offering good feedback and allowing experienced riders to feel where the kite is and what it's doing without having to look at it. The Blizzard is grunty. It will pull you through just about anything if you need it too. But its also nimble with exceptional gust handling with the ability to dump power rapidly by sheeting out with minimal reliance on using the trim system in all but the sustained winds at the top of the kites given wind range. This is part of the reason I think it reminds us of the Access V7. The Blizzard has got surprisingly good upwind performance and can be worked to get upwind better than you would expect. Downwind performance is very good as well and it goes downwind without the need to spool up a lot of speed beforehand. As with many kites there is often a "sweet spot" in the size range that seems to have the best all round performance for the widest spectrum of riders. Maybe it's a function of the scalability of the kite whereas one size really captures all the best qualities while some of those qualities fade as the kite is scaled bigger or smaller, with the Blizzard we have found the performance to be consistent throughout the sizes we've been demoing. There have been no surprises and no let downs and the sizing is consistent with rider weight with roughly a size change per 50lbs. For example 180lb rider would be on the 9m where a 130lb rider would choose the 7m and they would be very evenly matched. Reverse launch is as simple as it gets with the Blizzard. Rarely do you need the kite to roll completely over as the fast turn rate and tight radius allow for simple reverse launch and turn. The fast turn rate also pays off at the low end of the wind range allowing skilled riders the ability to work the kite and squeeze every bit of performance out of them they can. The lift on the Blizzard is quite good. The fast turn rate and tight radius allow for snappy jumps but with very smooth power delivery. The fast turn rate also allows for easy mid-flight corrections when needed. The jumping is consistent through the sizes but obviously better glide in the 9m+ range. Stability of the Blizzard V1 is excellent. Better slightly than the Frenzy and Summit and less tip curl prone than the Summit was. For an open cell foil it is about as stabile as they come. It is prone (like any open cell) to sudden directional shifts in wind but is often easily recoverable. And it tends to sit pretty much in the center of the window and does a good job drifting when the lines go slack in a turn, similar to a wave kite. It sits well at all positions of the wind window edge and exhibits very little over flight tendency although we did see it to some extent in high gust situations, conditions where you wouldn't park the kite at 12:00 anyway. The overflight is easily offset by sheeting in and stalling. ​ The build quality is typical of what we've become accustomed to from Ozone. There really isn't much that we can say beyond they are still building solid, well thought out kites. The Blizzard is no exception. There are no surprises with this kite. One thing that is different with the Blizzard vs. the Frenzy and Summit is the addition of blow out valves to reduce the risk of damage due to internal over-pressure in the event of a leading edge down crash. These used to be found only on the Access series kites but they make good sense for any open cell in my opinion. Especially in a backcountry situation where a miscalculation or some unforeseen event causes you to whip the kite in, blow out a cell or two and strand you. The blow out valves can be a day saver. Another difference between the Blizzard and the other the Summit, is the lack of leading edge battens. And the Blizzard has similar intake design to the Summit V4. The blizzard still has leading edge battens but only in the vent areas. Maybe to ensure ease of vent opening and inflation while reducing weight by not stiffening the entire leading edge. And also like the Summit, the Blizzard has much fewer intakes than the Frenzy V10 had and all are mesh covered. Just as the Frenzy and the Summit before, the Blizzard comes with a quality technical backpack. Big enough to easily fit a couple of wings for long tours as well as snacks, skins, etc... It also has the loops for securing skis or a board. 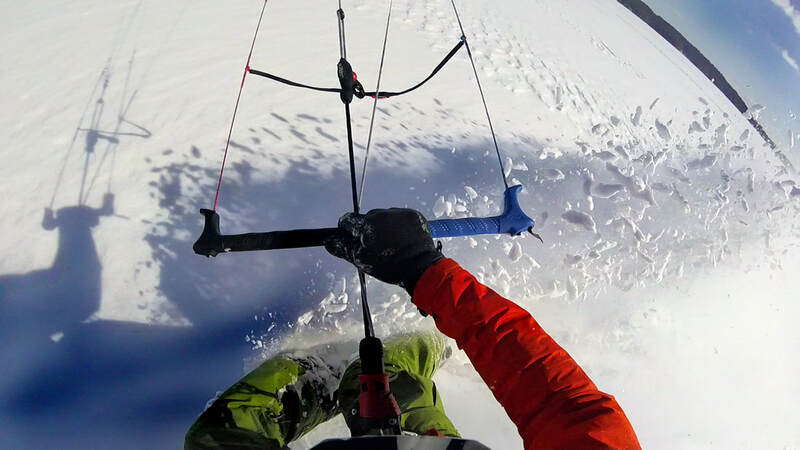 And like the earlier performance series kite packs, the Blizzard pack integrates with the Ozone Connect series snow kite harnesses. ​Bottom Line: The 2018 Blizzard V1 delivers just as promised. Plain and simple. It's a great all rounder and just straight up fun to fly. A kite for advanced riders but also a kite for intermediate riders looking to add something to their quiver that feels familiar but something that as their skills improve, there's no risk that they will "outgrow" the kite. And a higher performance addition to their quiver without adding too much risk as again, it really tends to do only as told. It can be a hucking machine, a sporty backcountry touring kite or just a wing to rip around your favorite spot all day long. Flysurfer Peak 3 Long Term Review. "The PEAK3 features everything a passionate freerider’s heart could possibly desire – a highly-efficient and durable Single-Skin concept, simple set up, and easy to fly. Plus it offers power on demand with superb safety. Designed for universal use, it sets the standard for a touring kite. Adventure awaits you.."
We feel there is a lot of truth to the Flysurfer description. In our experience the Peak series is a kite that many people either love or hate. and to be fair there have been some bumps in the series but for 2017 Flysurfer has done a very good job of smoothing them out and has produced a much more refined Peak that might make believers out of some of the haters. And it still stands as an excellent touring snow kite. About the Peak 3. First a trip down memory lane. 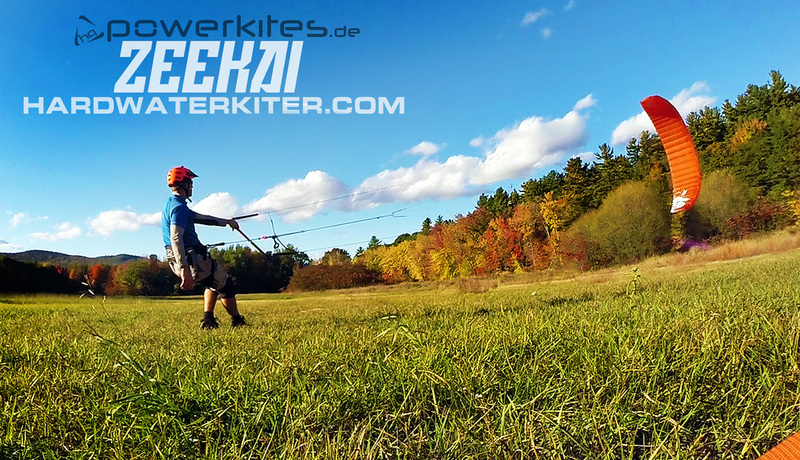 HARDWATER KITING has been selling and using the Peak series kites since the very first Peak1 was released. Initially we were skeptical but as always, we are more than willing to try any kite we can get our hands on and on paper, the Peak1 fit PERFECTLY for the type of riding we tend to do here which is mostly lake riding and more specifically touring. The Peak1 was a purpose built touring kite in every sense of the word. Safe, simple, bare bones with extremely good pack ability and an amazingly broad wind range. A wind range that could be widened further with some minor additions to the bar set up. As a first release we were really impressed are ar so to this day, we still have our very first 6m Peak1, one of the original pink ones, which we still use for lessons from time to time. Really in our opinion the Peak1 was perfect for its intended use. The only shortcoming was the leading edge durability. The Peak2 was a step up in performance depending on what you were looking for. It was a higher aspect ratio and was able to generate more lift than the Peak1. It also went upwind better and was given a more refined bar that included a trim system. Also additional sizes were introduced, a 4m and a 12m. We felt this to be a blessing and a curse. As a touring kite, we like a kite with minimal lift. And given the depower range of the Peak available simply by sheeting the bar, we felt that the trim system was unneeded weight and complexity. The bar also had a stopper ball to "park and ride" the Peaks. Peaks are great at gust management but much of it comes with actively dumping the gusts while sheeting out. A stopper bar hinders this and locally, the stopper bar is almost unusable due to the gust range and frequency we have here. Although when used in conjunction with the trim system it does serve well as a means of setting reach for riders with shorter arms. There were some mixer issues with some of the Peak2 series and many had to be tuned before they would fly properly. For some people who bought Peaks and weren't familiar with flying foils in general, tuning was a daunting prospect. And sometimes it was hard to tell if the kite was an issue or if the pilot was. Sometimes it was both, often it was the owner. It made for some headaches for everyone involved but for the most part it all worked out and the Peak2 made for a good all round kite. And for low wind performance, for the money the 12m was an incredible deal for a light wind day saver and still is with the Peak3. So here we are with the 3rd version of the Peak series. And I have to be honest we were a little bit wary of another new Peak revision after some of the headaches the Peak2 caused us. But Flysurfer seems to have done good job with the Peak3 and made some pretty substantial changes in both the design and the resulting flight quality. On the surface the kite looks very much the same as the Peak2 but the ride quality is better for certain. Safety Systems : As with the two previous versions the Peak comes stock set up for use with a Front Line Safety (FLS). 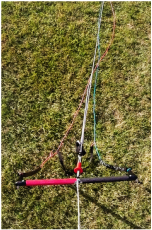 We now sell the Peak3 as a "kite only" (KO) option so you can save some cash buy buying the kite and mating it to whatever 4 line, FLS bar you wish. Usually with minimal if any, bar tuning required. However for 2017 Flysurfer has added a "Reefline" safety system to the Peak3. Somewhat similar to the safety on the Viron DLX or Ozone's ReRide. It consists of a 4.5 line (which is supplied with the kite) actuated bridle assembly that runs within the leading edge of the kite. When the safety system is activated the 4.5 line will draw on the internal bridle and cause the kite's leading edge to fold like a concertina and completely disable the kite. The kite falls from the sky with little to zero impact to the rider when activated. It's very affective and once you get used to it, pretty easy to use. And we find it can be used as more than a safety option but also as a landing/launching method. We found that if the reefline is activated and the kite is left on the ground in shifty winds, things can get messy. Although this is the case with most kites and also when using the FLS. The Peak3 is supplied with the reefline 4.5 line in the package. This line seems to be pretty much intended to be used with Flysurfer bars using FLS and 21m lines. When trying to install this safety to other bar systems or with other line lengths, you're going to have to figure out some extensions (linked at the kite end, not bar end) for the 4.5 line or find/make a 4.5 line that matches your lines. Also, the 4.5 line IS NOT 21m long. It's longer. This is because the 4.5 line feeds in through the front of the leading edge whereas your other lines need only to reach the connections on the speed system. And when using a bar with a Y or split line system, as far as we can tell you will have to use the reefline safety. For simplicity and ease of set up, if you want to use the optional reefline safety system the quickest easiest way is to purchase the Peak3 with an actual Flysurfer bar. With the Flysurfer bars, if you want to intstall the 4.5 line it's much less time consuming than trying to adapt it to other bars. Now, to be clear, this is an optional safety feature. The FLS on the Peak3 works great. But, the reefline is a pretty sweet safety system. We've been selling the Peak3 with the Infinity 3.0 PP bars as they connect directly to the kite right out of the bag and fly great. The sheeting range the PP bar provides is plenty to take advantage of the Peak3's depow range and in the event that you do get in a bit beyond that, you can always trim. Handling : The 2017 Flysurfer Peak3 has improved greatly in flight quality over the previous versions. The turn rate is still near stunt kite levels while the feedback and bar pulse when depowered is almost gone. We were willing to live with the bar pulse on the other versions given what we gained otherwise. If you didn't hold the bar too tightly it really wasn't an issue. But now, you can have the depower performance AND a fairly smooth ride. ​Is it as smooth as other kites, both open or closed cell? No. If you are looking for the smoothness of a Speed 5 or similar, this isn't going to give you that. But it's pretty close, better than the previous versions and a joy to ride. ​Turn rate. Turn rate is on par with the Peak 2. We don't have any Peak 2's left to do a side by side but IMO the Peak3 has a slightly better turn rate from what I remember of the Peak2. Bar pressure through the sizes is pretty good though maybe higher than some other kites on the market. The Peak3 still uses a 2:1 pulley system but they have somehow managed to omit one ​pulley on each side. Thus reducing weight and bridling and drag. When steering aggressively you can really see the amount that the wing distorts. The size with the broadest usable wind range for most riders still seemed to be the Peak3 6m. We feel it's the "sweet spot" in the size range as it has solid high end wind range but a good lower end range on firmer snow conditions or ice. Both ends of the wind range on all sizes is easily enhanced or reduced with longer or shorter lines. Although adding line extensions or half lining is less simple when using the reefline safety. The 12m as always is a light wind powerhouse. I was able to ride with other riders who were considerably lighter than me in winds that warranted an 18m Chrono and 19m Zeekai. Across the wind I was well powered and able to keep up no problem. Down wind was "ok" while upwind I didn't stand a chance. But the 12m will get you up wind eventually in low wind days. Lift. As far as lift goes, it seems about the same as the Peak2. Like other touring kites, the timing is a little bit different. Although I will say the 9m is pretty fun to jump with. Snaps turns faster than the 12m but floats better than the 6m. All in all the handling is very similar to the Peak2 just more refined and generally nicer to fly. Stability. Stability of the Peak3 is excellent. Best yet in the Peak series. It still has some of the odd single skin tendencies that we see in light shifty winds when stationary but nothing out of line and when riding the kite is rock solid and stable enough to take your hands off for a quick second to zip a jacket or put gloves in while moving. ​Using the PP bar system is comfortable to use with or without gloves. Occasionally the 4.5 line will get tangled and requires a quick "pluck" like an old school 5th line. In flight there is a fair amount of 4.5 line flying out there. On the ground they handle much like the Peak 2. Although they seem to sit on the brake lines better when stalled out. As with all Flysurfer products they do not come with a stall handle so securing the brake lines is more of a hassle than some kites but doable. We like to install stall handles on our kites. Reverse launching is a dream and effortless in all but the absolute lightest winds. In terms of other uses, the Peak 3, like the previous versions, is still a great street kite. Throw it on a bar (or even handles) with short 5-11m lines and you have a kite that is awesome for kiting tight areas, parking lots or any place where you would not expect to kite. Build Quality: The Peak3 is well built and what you'd expect from Flysurfer. We haven't seen anything yet that seems like a potential failure waiting to happen. Many of the wear areas and "weak links" went away with the Peak 2 and the Peak 3 is no different in that respect. Flysurfer say's the leading edge has been reinforced (thus the grey color?) and the training edge is also reinforced. It has the regular LCLs and other features found on more costly Flysurfer offerings and the overall build quality is solid and we've seen nothing at this point that causes concern. On a side note, we would also like to say something about the Peak trainer. Though not a depower Peak it still flies great and could even do some amount of duty as a pulling engine for some. Really, if you are looking for a fixed bridle 3 line trainer, it's a good little kite. Bear in mind, it is a single skin Peak and like it's bigger depower siblings it has more power for its size than other 1.3m kites. In fact it pulls much like many 2-3m trainers. It is not at all like an HQ Symphony 1.3m for example as the Flysurfer 1.3m Peak trainer can actually do some pulling in the right winds. If you have any questions, want to purchase or demo the new Flysurfer Peak 3, we have them in our school/demo fleet and still have a couple more weeks of snow kiting left this season. ​So please come check them out while the riding is still good. 2017 HQ Matrixx III. Pt. 1 First Impressions. About the 2017 Matrixx III. HQ does a great job of producing a kite model and sticking with it for a few seasons before they offer a new version. Regular updates and improvements are always welcome but it can be frustrating from a consumer point of view and for the dealers. But HQ tends to stick with stuff for a bit before any major changes. For example the original Matrixx was around for a while before the Matrixx 2 came out. The Matrixx 2 was a considerable jump in design and performance over the original and an absolute joy to fly and came out a few years after the original. ​This year however, counter to HQ's normal product release cycle, they have already come with an updated version of the Matrixx and we now have a 3rd version. After some production issues with the Matrixx 2 series HQ now has a new design being produced in a new factory. Though the kite looks very much like the Matrixx 2, the Matrixx III has had some changes made to enhance it's performance and optimize it to make it more compatible with rapidly growing and popular foil boarding segment of kitesport. How do these changes benefit those of us on snow? Only time will tell. But even in the short amount of time we've spent playing with it, it is clear that the new kite offers a very similar comfortable feel that we loved about the Matrixx 2 but with a bit more performance. Handling : Like the Matrixx 2 in experienced hands the new kite launches easily without any pre-inflation. Riders less experienced will benefit from some amount of pre-inflation but really, with a little practice, it launches pretty easy right out of the bag. A little extra back line tension as you launch is helpful. The intakes on this kite have been repositioned to help improve inflation and maintain internal air pressure and from what we saw they do a very good job. 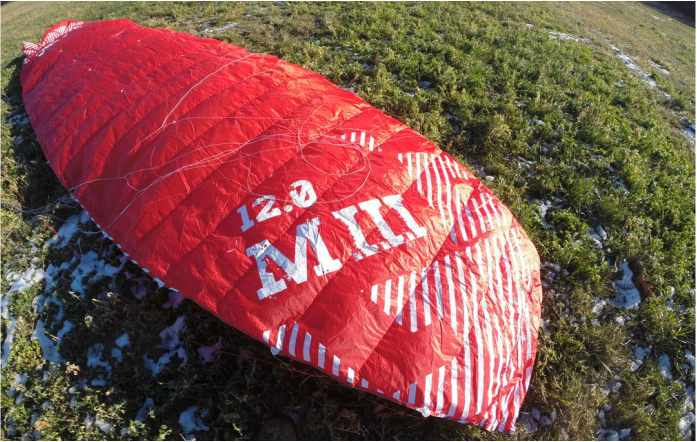 The Matrixx 2 inflated very well and this kite is even better. Once in the air the Matrixx III feels a bit more "sporty" than the Matrixx 2. Turn rate is faster and it feels more lifty than the Matrixx 2. This could simply be a byproduct of the shorter turn response or it may actually be generating more lift. My feeling is that it is a little bit of both. Until we really get out with it and put the kite through some proper paces, I really can't say for sure. But I can say that I like the feel and the snappy but smooth power delivery. Even in the erratic winds I've been flying this kite in the last few days (4kt-15kts) I felt comfortable snapping the wing around, sheeting in and getting some low but floaty static boosts. At speed I would bet the Matrixx 3, especially in the 12 and 9m sizes, will be a crowd pleaser for those who want to send it to the moon. The kite is uber stable. Being a closed cell it has some advantages in light shifty winds as it resists collapse and and is able to power through holes in the wind. 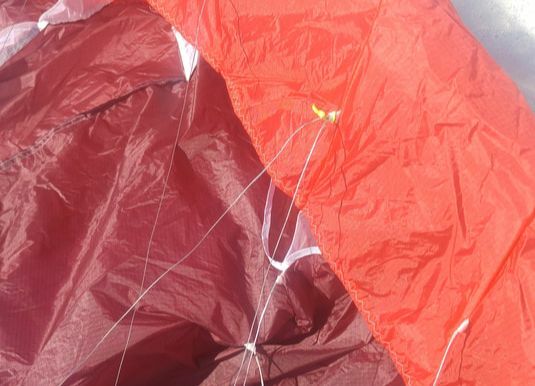 Some major shifts that caused the kite to fold in half, the internal air pressure helped maintian shape and greatly increased your chances of recovery. The same collapse on a kite like the Zeekai or other open cells would be less likely to work out. One thing that we noticed is some tendency to overfly in gusts when sitting at the zenith. Nothing drastic that couldn't easily be offset by sheeting in slightly or repositioning the kite but it was noticable compared to the Matrixx 2. By no means is it a deal breaker or a mark against the kite's stability. Just something noteworthy to anyone who is familiar with the Matrixx 2. Given that the Matrixx III has been optimized to make it more foil board compatible, and has a higher AR than the previous Matrixx series, it's not suprising that it exhibits some amount of overflight tendency similar to other high AR race variants. At a lesser level of overflight than many race kites but slightly more than you would see from the Matrixx 2. We think that the Matrixx III is beginning to blur the line between freestyle kite and race focused kites an the overflight that we saw is minimal and within reason given the potential performance benefit. It's worth noting that when set at the edge of the window the kite was very stable and rock solid, even in gusts and ehibited no overflight at the window edge, which for our area is important as we rarely can safely sit with the kite at the zenith if we need a break. Another thing we noticed is a lack of wingtip collapse. Even while hot launching a completely flat kite. Even if you get heavy handed and over bar steer the via the leader, the kite was solid and resisted wingtip collapse or wrapping around the bridle. Gust handling seemed on par with the Matrixx 2. 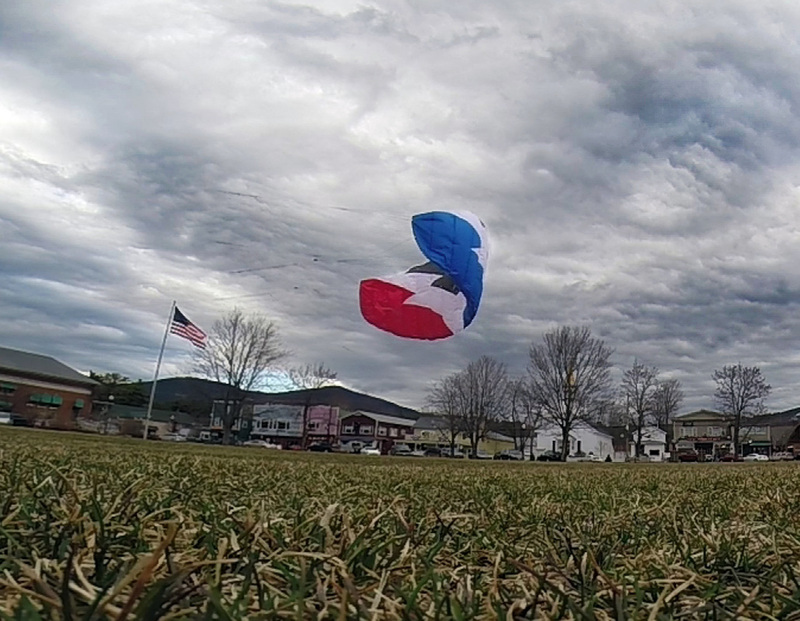 When static flying, you really get a sense of how well the kite is handling the gust factor as you don't have the ability to alter your ride to deal with it. The Matrixx III did very well in the gusts and the depower when needed worked as you would hope. Turn rate was slightly affected by trimming the kite out completely but it was still good. The Depower on this kite is great. Static flying you can trim it all the way out and bring it across the window and it is very gentle and forgiving. Let the trim out and she is a beast. Hard to say how it compares to the Matrixx 2 without side by side comparison but it is good and should instill confidence. Safety Systems and Bar : The 2017 Matrixx III uses a FLS (Front Line Safety). As we now sell the kite in the KO (Kite only) option, this means that anyone with a 4 line bar that uses a FLS safety, can mate thier bar to the new kite. Some people may find that some bar tuning is required to get the best perfromance out of the Matrixx III but this could be as simple as adding a few pigtails. There is nothing exotic here and the kite should work fine on most 4 line FLS bars. When the safety, a push away design, is activated the Matrixx III flags out off the front line. The kite is attached to your lease by a 4.5 line that runs through the CL, bar, a ring on the cleat and then the spinner. When activated the bar slides down the 4.5 line and eventuallyto a stopper. Like other systems, the stopper needs to be at least the wing length away from you to flag out effectively. Which this is. The 4.5 line has an integrated bungee which does a good job of mitigating the shock that can occure when releasing the kite. It works well and takes the edge off. ​Like many FLS systems, the kite can flop around a bit upon release. This might make a mess in the lines while the bar is sliding to the stopper. If you pay attention to what the bar is doing it is an easy thing to pick up the bar, reset the safety and feed the 4.5 line out until even line tension and relaunch. The only "issue" we had with activating the safety system is occasionally one of the bridles would fall behind the wingtip. This is not uncommon with kites that have long thin bridle assemblies and it is easily remedied by rolling the kite over, leading edge down, and reverse launching. ​The FLS is the "end all" means of bringing the kite down. Otherwise, depending on the bar you use, a stall handle is likely your primary means for landing the kite. The bar we are using on the Matrixx III is the HQ One bar and it's the nicest bar HQ has ever offered. The only "downside" to it is that they have gone to stall/reverse launch balls on the back line leaders. Similar to what you see on other brands. Generally we install stall handles on if it doesn't affect the function of the safety systems. Stall handles are easier to grab with winter gloves and we will be installing them on our Matrixx III demos. ​The new vents are completely different. New rectangular shape and placed in strategic locations to ensure faster inflation rate and consistent internal air pressure. There are no odd panels cut for the sake of graphics and the kite is covered with sublimated graphics. All the bridle points look solid, the rear zip is the same as years past and includes the lycr bit to cover the zipper and keep it from snagging. The dust outs work well are big enough and have the blocking flap to allow you to fly with the dust outs open incase you need to vent water, sand or snow. ​ The kite flies very well with the dust outs open. The Matrixx III has a higher cell count than the Matrixx 2 did. The cell counts are the same throughout the entire size range. ​​Bottom Line: As I type this review the snow is finally falling and in the next few days we should have conditions worth riding. Once we get to use the Matrixx III in motion it we will have a better idea of the kite's personality and performance. Obviously static flying isn't going to expose all the traits of the kite to us but it does let us know a lot about it. If the kite can fly well in choppy winds and be managed while standing still in most of it's wind range, it's a well behaved wing. At this point we're pretty excited about the Matrixx III. I have confidence that it will be as great a kite as the Matrixx 2 and a good option for anyone that wants a kite that can do a bit of everything and do it well while not killing off thier bank account. As we said last year, HQ is really producing some great kites and the Matrixx series is really worth considering if you are in the market for a new wing. Especially if you are in the market for a kite to ride year round. Stay tuned for Part 2 of this review which will be posted as soon as we can get out and really ride! If you'd like to come demo the new 2017 Matrixx III or purchase one HARDWATER KITING (www.hardwaterkiter.com) has them available for this winter. Come visit and check them out! Nobody can question the value of a good trainer kite. Trainers allow you to learn kite handling and wind window management in a relatively safe manner of a kite that generates minimal pull in certain wind range. Traditionally trainer kites have been fixed bridle types with no depower available apart from making adjustments to the brake lines. And unlike actual full function depower kites the outer lines, AKA steering lines, on the common fixed bridle trainer also double as steering lines. While the center line(s) act as the braking lines. This often poses a problem for beginning kiters who have been practicing on a trainer and are now transitioning to a full function depower. 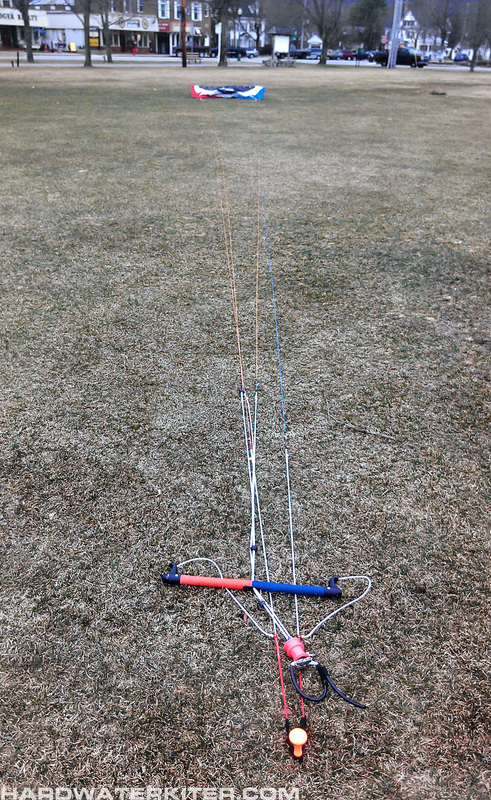 Much of the muscle memory and skills learned to keep the fixed bridle trainer in the air won't work on a depower kite. In fact they will actually hinder it's performance. Frustration is the common result. From a school perspective we find that valuable learning time is often used up as we try to break students (either experienced fixed bridle kiters or beginners with a lot of trainer hours) of the habits they learned when flying on their own. Again, this is why Hardwater Kiting stopped using fixed bridle trainers in our programs 2 years ago. Fixed bridles hindered the learning process more than they helped. So if not a fixed bridle trainer, what can you use to learn to fly safely and with minimal risk? Well, given the quality of the safety systems available now and the huge levels of depower that kites possess, a small full fledged 2.5-4m depower kite is an option. However for many beginner riders the cost of those kites can be a bit out of their price range for training purposes and the few nuking wind days that they can actually ride with it. Although a small depower for high winds should be considered for anyone's quiver as it will add sessions just like a large kite for light winds will. So what can I use that won't cost me $700-$1000? Enter the HQ Rush 300 School. 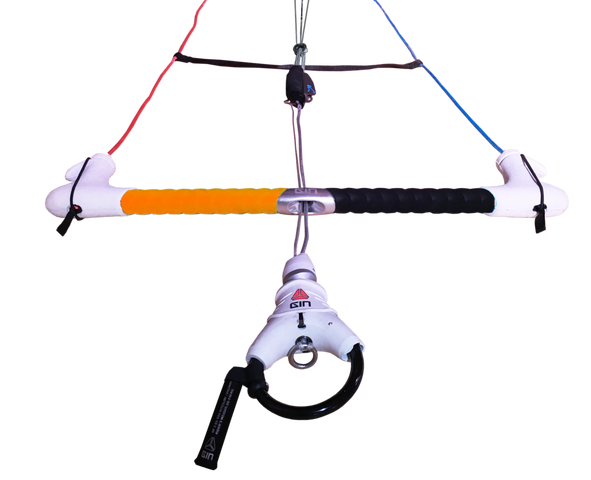 About the HQ Rush School: The HQ Rush School is a depowerable version of the HQ Rush fixed bridle trainer kite. It comes only in 3m and comes ready to fly, kite, bar and lines. There was a bit of a delay in the release of the Rush School 300 but it was worth the wait. The Rush School fills a gap that we feel is not often noticed or given much consideration. It's a price point ($375), depowerable foil trainer making it much more suitable for learning in areas where wind quality is not ideal and for kiters looking to advance to riding modern depower kites. Unlike fixed bridle trainers it can be depowered when things get nasty and has actual safety systems when all else fails instead of just a simple wrist leash. Set Up and Launch: Set up is pretty straight forward and not unlike other foil trainer kites. You will have to attach the lines the first time out but the lines are numbered and the kite is carded with and installation guide. The bridle system is extremely simple, brightly colored and has little tendency to tangle. When anchored by the stall handle the kite sits extremely well in the center of the window regardless of wind speed. 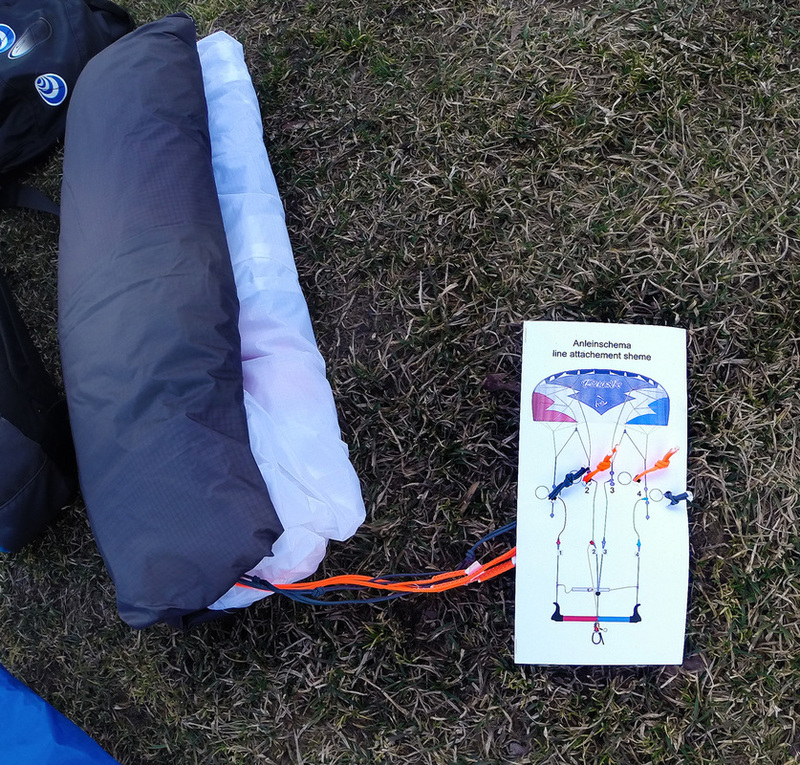 Launching is about as user friendly as you can get and the kite opens up and inflates instantly. It launches well in light winds and high winds and has some amount of tunability to enhance or limit its performance. The HQ Rush School doesn’t use "kook-proof" attachments but the instruction card clearly shows proper set up. Handling : Pleasantly surprised to say the least. The HQ Rush School can be adjusted via knots on the rear bridles and offer a wide range of adjustment to suit the pilot's handling preference or wind conditions. When set at the knots closest to the wing the kite has near stunt kite flying characteristics. At the setting farthest away the steering is still responsive but somewhat muted and good for beginning kiters, especially those who are a bit heavy handed initially. The middle setting will work for most people and seems to provide the best all around performance. Since the setting are knots they can be removed and re-positioned to better fine tune the kite's steering and sheeting response to individual tastes. In general all the settings are fun to fly in. At the softest setting there seems to be a lot of rear line slack though it handles just fine. We flew the HQ Rush School side by side with the Ozone Ignition 2m fixed bridle trainer and the Flysurfer Viron 2.5m for comparison. Bear in mind that sizing on any of these kites is subjective and we were simply looking for power comparisons in a given wind range. In a nutshell in moderate winds the HQ Rush was about equal to the 2m Ignition which was expected given that fixed bridles offer more power per size than their depower counterparts. In higher winds (gusts to about 20kts) the Ignition became lighting fast required some muscle to hold onto while the HQ Rush School was simply sheeted out and pulled much less even directly in the window. And of course you are harnessed in so this is all while finger tip steering. When compared to the 2.5 Viron the Viron seemed to provide slightly more raw grunt when powered and slightly more depower when sheeted out. SLIGHTLY. Unlike the Viron the HQ has no trim system which in our opinion is not a problem, the sheet effect is plenty of depower. However the turn rate on the HQ Rush, even in the slackest setting, was more sporty and seemed more precise. The factory wind range for the Rush School is 5-28 mph. Gust handling of the HQ Rush School is excellent. No sudden surges in power, kite sits nicely, very little over flight when directly overhead and very little if any lift generated. We tried getting little boosts out of the Rush School but to no avail. Once in the air the HQ Rush School is striking. The red, white and blue color way looks great and is a real eye catcher. Relaunch: Relaunch of the Rush School could not be easier. Reverse launches are easy as well via the stall handle and landings using the stall handle are smooth, easy and precise. Safety Systems and Depower: The HQ Rush School safety systems are activated the same way as many other kites on the market today. HQ has re-purposed their older non-magnetic chicken loop safety to the Rush School and the kite is killed by a front line flag out system. It's simple, intuitive, easy and effective. Be aware this is NOT A LEASHLESS SYSTEM. A leash attached to the 4.5 line is required to use this kite safely. Pop the push away safety at the chicken loop and the kite flags out on a single front line and falls from the sky. The simple bridle system seems to do well not to get tangled and reloading and launching after activation is pretty simple and quick. Depowering the kite is a matter of simply sheeting out. Many of HQ's other kites that had this chicken loop had issues with reach when sheeting out for smaller riders or riders with shorter arms. This doesn't seem to be an issue with the Rush School. When you want to dump power, push the bar away. "When in doubt, push the bar out". When you want more grunt or sporty handling, sheet in. Sheeting in with the bar turned produces very little bar bite (resistance friction on center lines when sheeting) and functions very well. Build Quality: The HQ Rush School seems to have the same build quality found in other HQ Trainer offerings. Clean simple and built to take the abuse that trainer kites are often subjected to. 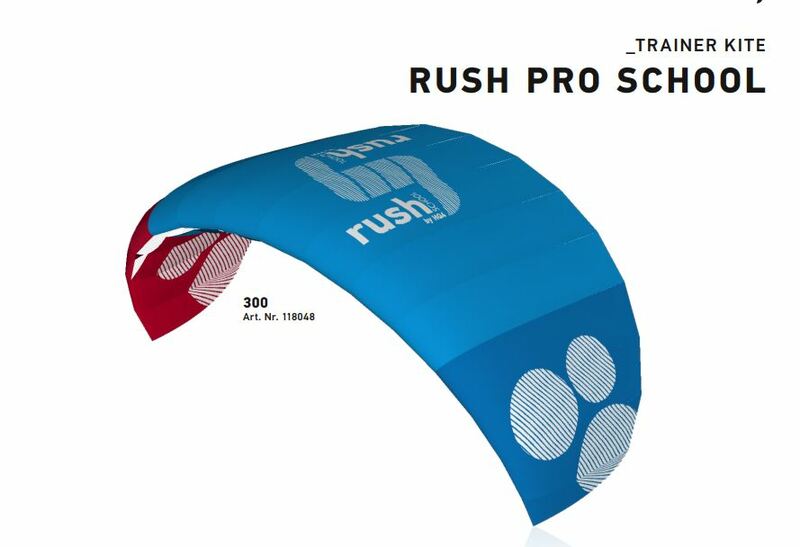 The HQ Rush School is looking like a long term, durable kite that will offer many years of fun. Design details are well made and work as expected. The simple and brightly colored single pulleys bridles are stout and look like they will resist wear for a long time. As we often say, very few people sell off a trainer after they outgrow it as the trainer often becomes their high wind option. This kite especially fits that scnario. Someone asked if the Rush School 300 could be flown without a harness. Like an old school traditional fixed bridle trainer. The answer is "Yes". If you set the back lines to the knot furthest away from the kite, it will fly unhooked quite well. But, still having the added benefit of a front line flag out if you were to affix the 4.5 line to yourself in some many. I just wore a harness and hooked my leash in and flew unhooked. The kite flies quite well unhooked but we think if you to ad a 30mm pigtail to the backlines, the performance wound be even closer to what you would find with a fixed bridle. This review is still relevant to the current version of the HQ Rush School. The current kite is a different color. Nothing else has changed at this time. 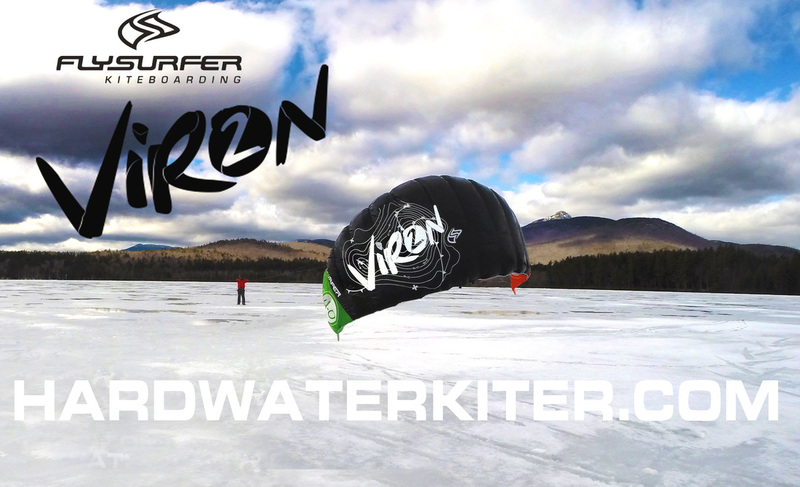 At HARDWATER KITING we've been using the Viron 2 as a back up school kite to augment our school kite quiver. Having a 2.5m closed cell depowerable kite is great when you are faced with students in the sub 100lb range or for a kite to be used strictly as a trainer for raw beginners. However we have found the Viron to be a great kite in all it's size options and we felt that after a sufficient amount of time in our service it was due for a review. So here we go! About the Viron 2 DLX: The Viron 2 DLX is Flysurfer's entry level closed cell foil. Intended primarily as a beginner/instructional kite (a task which it excels at) with a top end factory wind rating of 40 kts for the 2.5m it is a phenomenal high wind kite as well. The design has been around for a little over half a decade and although the original in our opinion was not a great kite the current version is more refined, more lively and fun to fly while retaining the docile qualities that make it an ideal kite for novices or riders who want to fly something that won't get them into trouble in conditions that are outside their comfort zone. The Viron 2 DLX is confidence inspiring to say the least. Set Up and Launch: Set up is pretty straight forward and not unlike other foil kites. The bridle system is extremely simple and doesn't have the same intimidation factor that other kites may have for riders who have not flown foils before. Initial launch can be somewhat tricky, especially in light winds as the kite is closed cell and effective flight is impossible until the kite builds internal air pressure. The DLX (light weight) material and the resulting reduced weight offers considerable benefit in the initial launch however. All the Viron 2's have only one intake yet in a steady wind, even light wind, it tends to inflate rapidly. On really cold days we found that it's a good idea to reach into the intake during set/pre-flight and open it up a bit as static cling will reduce the airflow and slow inflation. Unlike some other closed cells however, the Viron 2 intake is open and easily accessed. Handling : The Viron 2 DLX, when first flown, may be a bit sluggish for some people's tastes. It's slow methodical and completely absent of any rapid response to steering inputs. This is likely intended as it keeps novice fliers with zero experience from making errors due to heavy handed steering inputs. For raw beginners we feel this is beneficial but for experienced fliers it's just really sluggish. However the steering response can be adjusted with setting found under the floats and the kite can be set to fly much more responsive and similar to what one might expect from most kites. The stock setting ranges will work for most people but the settings, which are knots, can be removed and re-positioned to better fine tune the kite's steering and sheeting response to individual tastes. For the kites we use in our lessons we adjusted the knots to fly best in the broad range of conditions we experience here in New England. Once in the air the uniqueness of the Viron 2 DLX become evident. It is an odd looking kite without a doubt with an unusual shape and bridle system. One would even say it is somewhat ugly but after using these kites for a while you come to appreciate that Flysurfer opted to follow function over aesthetics and have produced a kite that does as intended and does it well. The kite seems almost alive and in a short period of airtime you come to realize that these kites are clearly designed to instill a sense of security and confidence. Almost "cuddly" if there is such a thing in kite design. For trainer kites they are phenomenal. At Hardwater Kiting we discontinued fixed bridle (non-depower) trainer use 2 years ago. A move which some would say is wrong but one we think is prudent as it removes the confusion students experience when we shifted them from fixed bridles to depowers. Now, with a 2.5m depowerable kite we can train even the most novice riders on a depower with even greater safety than small fixed bridles ever offered and without any confusion as they transition to larger wings. This eliminates the time we often have to spend breaking the students of flight habits students developed while flying the old style trainers. Resulting in better use of their lesson time and faster progression towards being a self sufficient snow kiter. For advanced riders the Viron 2 DLX really shines. One of the few kites on the market that has a size that is rated to 40 kts on land this tells us that the kite is capable of so much more than just being a beginner friendly kite. Everyone knows how much we love the Ozone Access kites. They have proven to be some of the best high wind, gust handling kites we have ever had the pleasure of riding. The Viron 2 is right up there with the Access in terms of just being a dream to fly in the nastiest conditions you can imagine. In comparison you cannot go wrong with either kite depending on what you are looking for. The Viron 2 DLX is like a closed cell Access. It has slightly, SLIGHTLY less power than the Access in each size and slightly more depower. It's closed cell and can be used on water. However it does not go upwind as well as the Access and has a slower turn rate. If you want the absolute easiest and forgiving kite the Viron is the one to go for. The Access for a little more excitement without getting into freeride/style kites. The Viron 2 is a bit more forgiving than the Access and more forgiving of your mistakes at the cost of some "sportiness". In 30 kts on firm snow with a 200lb rider the 4m Viron is fun although can be a little under powered especially as you try to head up wind. The 6m is a joy to ride and all of these kites will change the way you look at high wind days. This kite eats gusts for breakfast! Relaunch: The Viron 2 DLX has what Flysurfer terms as "Auto-Relaunch". Memories are fuzzy but it seems to us the Viron 1 auto relaunch was exactly that, AUTO. The kite would simply roll over and launch itself with minimal or zero pilot input. For us and our teaching environment that was NOT a desirable trait. On the ice sometimes when the kite comes down you want to keep it down and let the student figure out how to relaunch. It is probably a great trait on the water in steady winds and direction but here in New England on the lakes, not so much. The Viron 2 however is less "auto" and more "assisted". The Viron 2 is extremely easy to get righted and back into the air. Reverse launches are a easy as can be. The low AR (aspect ratio) and closed cell design make maneuvering the kite back into the air almost effortless without being fully automatic. Again, when working to get the kite back into the air there are no surprises and the term "cuddly" comes to mind again. It is the easiest kite to relaunch that we've ever used. And being made of DLX material allows it to relaunch easily even in light winds. Safety Systems and Depower: The Viron 2 DLX safety systems are activated the same way as other kites in the Flysurfer line up. Pop the push away safety at the chicken loop however and unlike the FLS found on other kites the Viron has a small internal bridle system that compresses the kite while also putting all the tension on a single line attached to a small split at the kite's leading edge centered on the intake. This both kills the kite but also reduces its projected area. The kite lays dead. Similar to the safety found in the Ozones and similarly effective. Depower of the Viron 2 is broad, effective and responsive. The Viron 2's depower is a close match to the depower found in the Flysurfer Peak series but without the negative affects on flight quality. The bar throw on the Viron 2 is generally all the depower we have ever felt a need to use but all the kites come with a clam cleat trim system to mechanically set the angle of attack and further enhance the depower sheeting effect. Like many kites, heavy trim results in excessively slack back lines and extremely slow steering response. Almost no steering response if fully trimmed. But We have never had to fully trim the kites. Generally with just 3-4cm of trim and the bar fully sheeted out the kites can be flown directly across the wind window while generating near zero pull. There are a number of kites that come close to this quality but when you fly the Viron 2 you notice the depower is a bit more effective. Like other kites in the Flysurfer stable the Viron 2 uses "Triple Depower" allowing the kite to change not only angle of attack but also projected area and the kite's physical profile. It's really remarkable. Build Quality: The Viron 2 shares the same build quality found in other Flysurfer offerings and is top notch. Design details are well made and work as expected. The minimal bridles, the single pulleys on the wingtips, blow out valves and wingtip water drains are are solidly made and smartly placed. Little features like red and green wingtips, which aid in determining wing attitude and linsets that are mudular and allow easy half-lining (thus great increasing upper wind range on a given size) are helpful little features for us as we use them for teaching. The Viron 2 is said to be built tougher than the Viron 1 yet it the Viron 2 is made of DLX fabric. Stitching looks excellent and the only noticeable wear we've experienced with our kites is the centerline. Which is essentially the same as the center line found on the Peak 1 which also showed wear somewhat quickly. This was mostly evident on the 2.5 and 4m sizes. the 6 and recently released 8m kites have the Infinity 3 bar which has a better eyelet which seems to wear the center line a bit less. Otherwise the kites themselves have shown very little wear while in use in our winter conditions. Bottom Line: The Viron is yet another "dark horse" kite. It was designed to be the easiest and safest kite Flysurfer could offer and we feel they really nailed it. However it is also an incredibly versatile kite and is a valuable addition to anyone's quiver looking for an extremely safe and predictable kite in high winds or gusty conditions or a kite that they can let their novice friends play with and not be too concerned about what may happen if they make a mistake. It is a high quality product that offers many of the same qualities of kites like the Ozone Access V6 but in a closed cell, light weight material version and at roughly the same price. The more we use these kites the more we appreciate them and with a starting cost of $499 RTF for a depower 2.5m water relaunchable foil made of deluxe material complete with bar and lines its actually a heck of a value. Some fixed bridle trainers sell for $275 for comparison and are not depower, closed cell or made of deluxe material. ​Our only complaint, (and it's really specific to our use), is the color of the kites. The main body being black makes the Viron difficult to spot against the treeline. When someone is on the kite with it low in the window and more than a half mile out the kite becomes very hard to spot. In high winds with high haze we often keep an eye on each other by keeping tabs on other kites as the riders are usually obscured. Hard to see with the Viron. Otherwise it's a great, smooth and friendly kite. If you'd like to come demo the new Flysurfer Viron 2 DLX or purchase one you can come visit us on the ice or purchase them here on the website. HQ Zeekai Race Kite Early Impressions. This is just a preliminary review of the HQ Zeekai race kite. As you can see we don't have snow yet so we haven't had an opportunity to fully test them but this is our impression of it so far. About the Zeekai: A few weeks ago HQ contacted us and offered us the opportunity to try out the new 2016 Zeekai, their offering for the new and fast growing high performance high AR (aspect ratio) wing category. 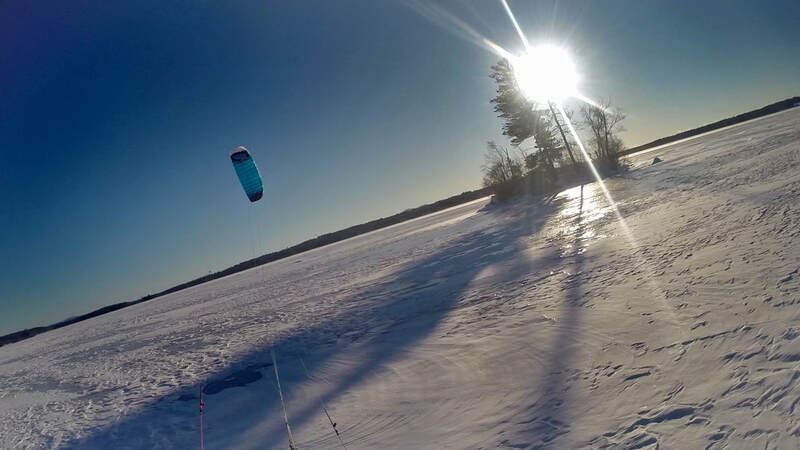 Although we don't have snow or ice now we still have places that are ideal for testing kites. And even without riding you can learn a lot about a kite's nature static flying it in places that are unfriendly to kites or poking around on a board or skates. If it flies well in those places it will be awesome out and on the move. The Zeekai is a kite that has been out and about for a little while this year but there has been little info available on it. Needless to say we were pretty stoked when the kites arrived. We love flying new kites! Zeekai is positioned as an advanced kite in the category we like to refer to as "Free-Race". Some people are using it for racing which in the HQ lineup it is clearly the most capable kite for that sort of duty. But it is also being promoted as a freeride option for those looking for big floaty boosts, speed and that sort of "V-8 Engine" unlimited power feel. Something common in a lot of these new race wings. Without a doubt the Zeekai will be a crowd pleaser for those looking for a kite like this. And let's not forget, it is also an excellent option as a light wind kite as they are all made of the same 20d UL material that the Matrixx 2 is made of. As with many of HQ's offerings, the Zeekai is a kite option that offers similar performance to other higher priced brands and models but for literally hundreds less. Light wind flying is the most expensive flying out there and the Zeekai makes it a bit less painful to purchase a kite that could potentially double your days in a season. Handling : The 2016 Zeekai is a surprisingly zippy kite in each of their given sizes. Even the 19m, in about 8-10kts is nimble. The turn rate on the 19m is excellent in all but the lightest wind conditions. We flew the 19m in 3kts (which is below its recommended bottom end) and as with most kites of this type, once it built apparent wind it pulled like a truck. But also as with most kites of this type, as soon as you needed to turn it becomes a struggle to keep airborne due to the slow turn rate in nearly no wind. If you actually moving and riding however, this would be much less of an issue. And based on how the kite flew in 3-4kts our feeling is it will be awesome for super light wind days on firm surfaces or ice. And a total riot on average wind days in deep stuff. Handling seems to be pretty consistent throughout the size range. Performance seems to scale well in all sizes though the 10 and 13m sizes seem to be the most fun as even in their "smaller" sizes the high AR and UL fabric make them extremely efficient and surprisingly useful even in sub-10kts. A skilled rider will be able to get significant performance out of the smaller sizes. Think HQ Montana 8 on steroids. The kite depowers well though it gets harder to fly when fully depowed and bar all the way out. This isn't uncommon with many kites but it's noteworthy. Sheeting out depowers the kite considerably and allows you to dump a lot of power even when crossing directly in the wind window. Unlike similar kites in this category (Chrono V.2, Sonic etc…) the Zeekai is open cell. We were surprised by this as there are people racing them on the water. We asked HQ about this and the feeling is that it's an extremely stable kite and if racing on water, open cell or closed, if the kite ends up in the water you are out of the race. There's some logic there and for our needs in the winter it's a non-issue. Being open cell means that in general it will go from launch to riding faster than the open cell counterparts. And when you land it, it lays flat whereas closed cell kites full of air can get pushed around and be less well behaved. While flying the Zeekai, after a season of flying the Matrixx 2 and other closed cell kites I found myself having to dig deep into the muscle memory to find my open cell skills again. Unlike other kites like the Ozone Chrono, when the winds shift drastically the Zeekai doesn't have internal pressure to maintain it's shape unless it's moving. So you either have to have a good sense of wind and be able to anticipate when things are going to change or be able to react and offset the changes. Both of which are much less of a problem while moving. The HQ Zeekai is a powerhouse. It has a lot of grunt for and a lot of speed. It sits a bit forward in the window and you can tell it wants to run. The bar pressure is direct and nice and not too heavy, even on the 19m. Sheet in and the power builds smoothly but quickly, not the "yank you feet out of your boots" type power build. Combine the speed, turn rate and AR and you have a hucking machine. Gust handling is very good. Not "great" but for a kite of this type and performance it's on par with others and better than some. It isn't as automatic as in the Matrixx, you have to actively sheet in and out to offset the gusts and if you fail to, you notice it. Part of flying an advance kite is being able to fly and in gusty conditions the Zeekai will be fine but you will have to know what you're doing. This is not a kite that we would recommend sitting still with at 12:00 over head in gusty conditions. It will loft you. On the other hand if you’re looking for speed, this thing will hook into gusts and give you turbo boost. Safety Systems : The 2016 Zeekai's safety is a little different than other offerings out there in that it comes with a "Top Hat" safety system. Those of you who have been flying a long time will recognize it for sure. Most "modern" kites are being produced with some flavor of FLS (front line safety) which when activated enables the kite to "flag out" on a single line and completely depower. The red "Top Hat" may seem a little dated and in truth it is. It's been used by HQ and other brands since at least 2004 however the opinion at HQ is that using FLS systems on these types of kites can be a messy thing. (And it's true, sometimes when using the FLS you end up with line nightmare.) and the top hat safety, which eliminates the load from your flying lines to the steering lines therefore inducing stall, is generally quite effective and a suitable option for this kite. And to be fair in practice it does work very well on the Zeekai. Better than most kites we've seen using this system. The only concern one might have with this type of safety system is that in high winds it can pose a problem if the kite flips leading edge down. Therefore enabling it to reverse launch and to some point generate some power. This is only in very rare and usually exceptional situations and if things get too out of hand there is always the chicken loop release option. One of the side benefits is that it is a leash-less system. So bar spins don't get messy. Build Quality: Like the Matrixx 2 from last season, HQ seems to have stepped up and built a really well made wing. It has the same super thin low drag bridles that we saw on the Matrixx 2 and combined with the 20d UL water repellent fabric the Zeekai is a very nice well made snow kiting option. The bridles are long compared to some kites but not unusual in this type of kite. Careful packing, especially being mindful to keep the pulleys on the outside of the kite when packing, will save you time later. The Zeekai bar system is similar to other bars in the HQ lineup. Its comfortable to use with or without gloves and neat and tidy. It's not as pretty as some bars but it's functional, durable and comfortable. One thing you will notice are the insanely long leaders. 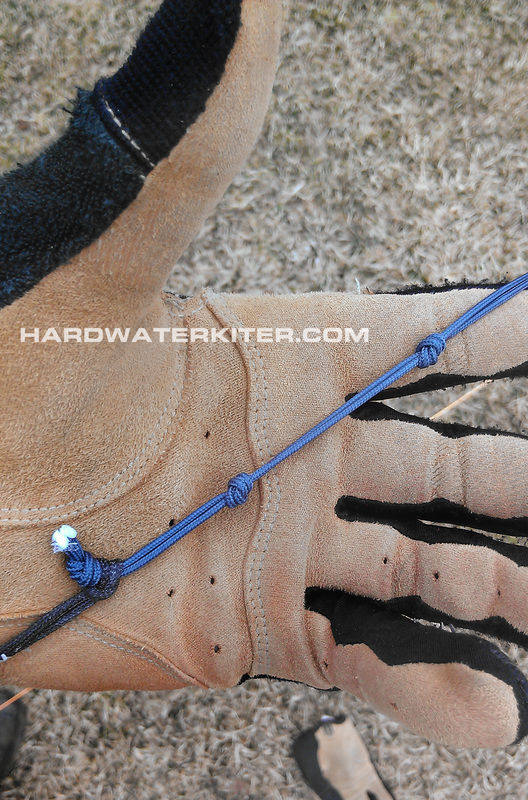 At HARDWATER KITING we like long leader as they are less expensive and fragile than your kite lines. This is important when crashing with skis or a board that has sharp edges. The long leaders keep your lines out of harm's way. The Zeekai has a long bar throw to accommodate the kite's wide depower range. And uses a clam cleat trim system with a substantial amount of adjustment. The trim handle is soft, large and easy to actuate even under load. Above the bar is a "mouse ear" line spinner to reduce line twists if you loop the kite a lot. It's a lighter weight option than the spinner found on the Matrixx 2. This is the same assembly that is being used on other HQ offerings that use a FLS safety. ​Bottom Line: The Zeekai might be a bit of a "dark horse" in terms of what people are riding and racing on and in the right hands we suspect the HQ Zeekai can hang with other, much higher priced brands. If you want a kite with substantial raw performance the Zeekai may be a good option. Especially if you are flying in areas with winds that tend to be more on the smooth side of things. In less smooth winds you're going to have to work a little bit just like most kites. For some of us that's part of the fun. If you want a kite to race on weekends and/or just rip around on when time allows and not have different kites for each discipline at $1999 RTF for the 10m the HQ Zeekai is a great option compared to similar kites on the market. Without a doubt it's an advanced kite for advance kiters looking for advanced performance. We're really looking forward to riding theses kites in the future. 8m Ozone Access at 52mph. 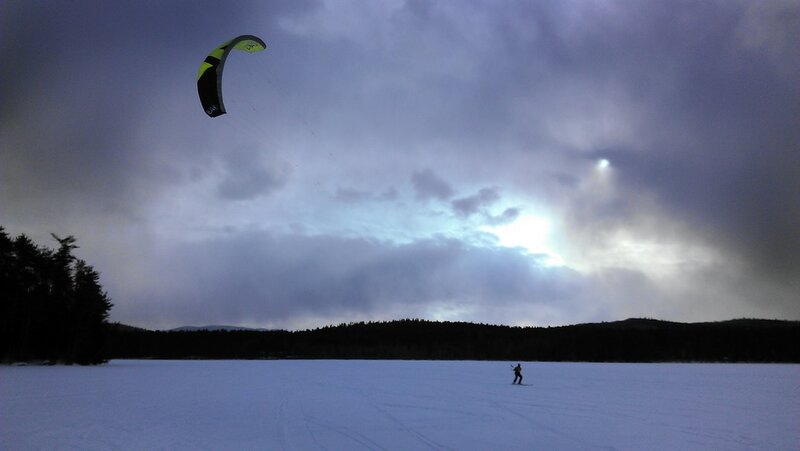 "The Access is Ozone’s entry level De-power foil kite that has been designed to make the learning process of Snow kiting as safe and easy as possible." This is in our opinion the understatement of the year. We don't deny the accuracy of it but really it doesn't do the 2015 Ozone Access series of kites justice. Hardwater Kiter Sandy on the 10m Access. About the Access: When HARDWATER KITING picked up Ozone we did so as an effort to expand the offerings of kites for our students and clients. Ozone has a long history both globally and locally in the snow kite game and it's difficult to find a snow kiter who has been riding the last decade who didn't own at least one Ozone snow kite at some point. Most of us got our starts on the venerable Frenzy series back in 2004. Honestly we didn't have a lot of personal interest in the brand after nearly a decade of drifting away from the Ozone locally and seeing it replaced by other offerings. Offerings that were either more affordable or better suited for riding in our generally tough conditions. That changed last season when we brought in some of the 2014 line as demo kites. We were thoroughly impressed with how far Ozone had come. Especially kites like the Access and the Summit. We weren't too excited about the 2014 Frenzy to be honest. Felt like the Summit and Access had a baby IMO. Not a bad kite just wasn't very exciting. Given that it has been completely redesigned for the 2015 season we can only assume Ozone felt the same. This season we purchase 2 kite quivers to be used for teaching/demo kites. In 2014 Access proved to be an excellent kite. We found it performed better than the kites were were using at the time for teaching. For 2015 we decided that we would use the Ozone Access as our moderate to high wind school kite quiver. In discussions with Ozone we found the 2015 was identical to the 2014 but with the new Re-Ride safety system. In our normally gusty conditions choosing the right kite for our students is critical in ensuring they feel safe and confident which is key to their success in learning. If you aren't comfortable and feel as though the kite is trying to beat you up, learning to fly will be stressful and not much fun. The 2015 Ozone Access eliminates the uneasiness that some people feel the first time the fly a kite. It truly is an awesome beginner kite as Ozone states. But really in terms of versatility and usefulness the 2015 Ozone Access is really so much more. Hardwater Kiter Jim in 7kts on the 10m Access. Obviously the 2015 Access is being marketed towards beginner riders. And without a doubt it is a top level kite for beginners. Ozone has a reputation for making top quality kites and even as a beginner kite the Access is still a premium wing with the same attention to detail that "higher" end offerings tend to get. And although it is being marketed as a beginner wing it really has a much farther reaching range of use. 6m 2015 Ozone Access in 30kts. The 2015 Ozone Access is an unbelievable high wind kite. As with most kites the factory spec'd wind ranges on the Access are pretty conservative. The low end wind ranges tend to be fairly accurate with the Access but the high wind ranges are a bit higher than spec'd if flown by a pilot with experience. We have flown these kites in gusts up to 45kts and the Access not only allowed us to to this with a feeling of security but also enjoyment. The Access will change the way you look at high winds. It is remarkable how the kite handles gusting and how stable it is. To the point where as an experienced rider I initially found myself doubting my senses. The first time we did a high wind test session on the Access we were riding in winds blowing 30kts gusting to 45kts. When we arrived to the riding site all the information being fed to me by my eyes, ears and wind meter, told me we were going to be working hard today. Looking into a haze of snow being torn from a lake's surface and throw 25 feet into the air usually causes me to a little hesitation. But when we got into it, on the the Access, I comfortable as I would cruising in 15kts. In fact I started to doubt my senses. The lack of abuse I was experiencing, the smoothness in the wing and the fact that I was on a 6m without any need to trim, really made me second guess what I was hearing and seeing. I only became aware of how well the kite was working when another kiter asked me what kite I was on. He asked because he was getting the hell beat out of himself on a 4m while I was riding effortlessly. At that point I gave him the 6m and switched UP the the 8m. Again in winds gusting over 40kts. I had to trim the 8m by about 3 inches to be really comfortable. After the other kiter rode the Access for a while he decided there was nothing in his quiver that could do what this kite does and purchased one from hardwaterkiter.com. It was an enlightening experience. In conditions that I would normally shy away from bridled kites and resort back to my Peter Lynn Arc flying the Access proved to be more than suitable. Add the safety and effectiveness of the Re-Ride system and you have an amazingly safe and easy kite to fly. I know. "Amazingly safe and easy" isn't really the description that elicits feelings of excitement in kite terms. The Access isn't a lifty freestyle hucking machine. In situations where you want to fly an Access you don't want a freestyle kite. It's a "beginner kite" or more accurately we like to label as a "Touring" kite. Even the original Access was in kind of that same vein. Thus the name "Access". A kite designed for touring the back country just so happens to usually be good for beginners and for teaching. Low aspect ratio, easy to fly, low lift make it a winner in both categories. Handling : The 2015 Ozone Access is a surprisingly nimble kite. The turn rate is excellent and can be enhanced considerably with over bar steering. The size with the broadest usable range for most riders seemed to be the 6m. We feel it's the "sweet spot" in the size range as it has an unbelievable high end wind range but a good lower end range in non-deep snow conditions. As a school we really only use the 4m for high wind/small student situations. The wind conditions that would warrant use of the 4m for a rider like myself in the 200+ pound range are relatively rare and usually not much fun to fly in. Much like an 18m Ozone Chrono or 21m Flysurfer will ensure a few solitary session in light winds, the 4m and 6m do the same for high wind days. The 8m is a great all round kite and a good moderate high wind (25kt+) for heavier riders (180lbs)+. Although it has much of the depower and gust handling of the smaller kites it can still generate some lift if put in the right place. Intentionally or unintentionally. The 10m is a solid powerhouse. It will get you moving on smooth, firm surfaces in 7kts and is still fun up to 20kts. We haven't flown the 12m. We can only suspect that the 12m follows suit with it's smaller siblings but works as a better option for heavier riders in average to moderate low winds. Given the kite's nature and it's being made of standard material it is not a true light wind kite. Safety Systems : for 2015 the Ozone Snowkite Series received the new Re-Ride system. This is a purpose built depower specific to Ozone snowkites and found on all models but the Chrono. It consists of a 5th line actuated bridle assembly cunningly place inside the kite! When the safety system is activated the 5th line will draw on the internal bridle and cause the kite to fold up a bit like an accordion for lack of a better description. Essentially the kite balls up and falls from the sky. This system works great as a safety system but it also works well as a method for landing and relaunching. The ability to do this shortens launch and pack down times to just under 3 minutes without rushing. When we first saw the video of the Re-Ride system in action we were skeptical as what is often claimed to work doesn't work well in our shifty and gusty conditions. The Re-Ride however has been phenomenal and we are true believers in it now. The only snow kite that doesn't come with a Re-Ride is the _Chrono. As it's a closed cell for use on water as well as land having a couple of mid-wing holes probably isn't the best option. If you don't want to use the Re-Ride to land the kite the Access still has a brake handle which attaches to both back lines and allows you to stall land the kite the same way we have been since 2004. Note: this is the same handle used to reverse launch the wing. Build Quality : Maintaining Ozone's reputation for offering premium products the Access is built on par with the "higher" end offerings. The kite is made to be durable and is smartly designed. For example Ozone has implemented internal cross bracing in this kite which drastically lowers the number of bridles required. This reduces the parasitic drag as well as the risk of tangles. The Access has blow out valves that will reduce the risk of over pressuring and blowing out cells in a leading edge down crash. This is a great feature while learning as well as for advance riders in high winds who maybe make a mistake and whip the kite in. There are other brands that offer kites that may fall into the same category and use as the Ozone Access for less money. But the resale value and longevity of Ozone at just a couple of hundred more is well worth it down the road. The bar system is comfortable to use with or without gloves. Occasionally the 5th line will get tangled on the flag out ball and is sometimes difficult to untangle. This isn't specific to this kite or to Ozone mind you. This is a common problem at one time or another with most 5th line kites which is why we really like front line flag out systems over 5th lines. But as the 5th line actuates the Re-Ride and does it cleanly 99% of the time we are willing to live with it. The packs that come with the kite are very basic but seem durable. After a season of getting kicked around in the van, in the kite sled and on our backs they have held up flawlessly. They have enough room in them for a couple of kites as well as extra food/water and clothing. Bottom Line: For beginner kiters the 2015 Ozone Access will allow you to grow as a kiter but you will never out grow the kite as it will transition from your learning kite to your high wind weapon of choice. For expert fliers, over the years there have been a lot of kites that local riders have adopted for use in high winds. After flying the 2015 Access almost all the other kites seem like more work than they are worth in high winds. And much like a kite like a 18m Ozone Chrono will add to the number of light wind days you get in a season, a 4 or 6m Access will do the same at the other end of the spectrum. For both of the reasons outlined above the Access has been one of the most sought after kites we sell. 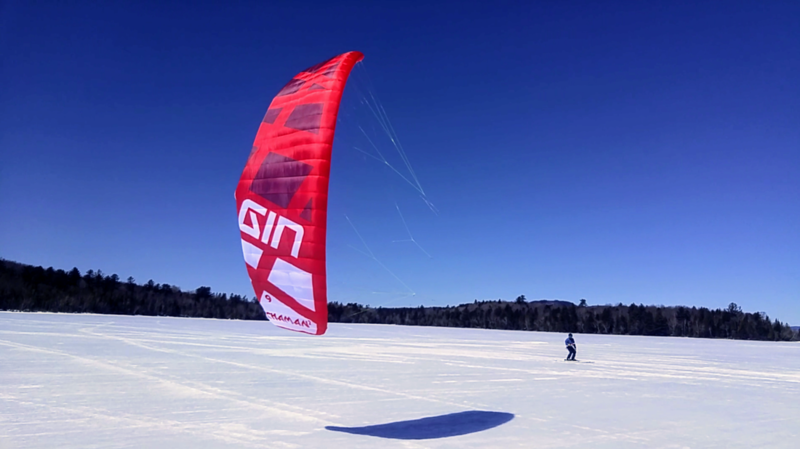 Kite design and performance has really improved over the last few years and a thoughtfully chosen quiver of kites will ensure that you are unlikely to miss a snow kite session these days. Whether a beginning kiter or expert the Access is an excellent choice for your quiver. If you liked what you've read and you found this review helpful in making a decision on a new kite, please show your support by purchasing your new wing from HARDWATERKITER.COM so we can keep the lights on and continue to offer this type of review. This is a bit of a "from the hip" review of the Matrixx 2. No particular format in the way it's outlined, just our thoughts as they come to us. As such this may seem a little disjointed but bear with us and we'll try to paint you a picture of this great little kite. First a quick word about some of the comparisons made out there between this kite and others. There's been a lot of discussion about how the Matrixx 2 stacks up against kites like the Lotus or Chrono. Really making those comparisons in our opinion is like comparing apples to oranges to potatoes. The Lotus is higher aspect ration (AR) and exhibits some of the traits that come with a higher AR such as higher speed and better upwind. The Chrono is a dyed in the wool racing kite. Even higher AR, even faster and even better upwind than both the Lotus and the Matrixx 2. Does this make the one kite inferior to any other? Not at all. It basically comes down to what you want and want you need. Just like any kite. Set up and launch. As far as closed cell foils currently on the market go that we've been fortunate enough to get to work with the Matrixx 2 is easily the fastest to get unpacked and into the air. We've heard murmuring of it being slow to inflate, slower even than the Matrixx 1. We didn't find that to be the case at all and in fact quite the opposite. The Matrixx 2, compared to the Lotus and Chrono (I know, the whole "apples/oranges/taters thing") is crazy fast to launch. However there is an occasional tendency for sticky intakes. Not sure why they stick but if the kite is packed away for a length of time the intakes may sometimes stick shut. We used to see this with Peter Lynns. Usually when it was cold and there was a lot of static electricity. Whatever the cause it's simple enough to just make sure they aren't sticky when you unpack the kite. The HQ Matrixx 2 is a completely revamped version of the Matrixx series. Most who have flown the original Matrixx 1 would agree that it was a great kite. And those who demoed and/or purchased the Matrixx 1 with us agree that even in standard material and 15m as the largest size it was a respectable light wind kite. Especially for lighter riders. We all felt that the if they were to make a Matrixx in an 18m or even just made the 15m in ultra light material that it would be an awesome light wind machine. HQ delivered on both fronts. Not only that but they added a smaller sizing, a new bar system and have made ALL SIZES in 20d light weight material. In fact the kite in our opinion is a substantial leap forward in design. The HQ Matrixx 1 is still a great kite but the HQ Matrixx 2 is easily on part with "higher end" offerings and at a considerably lower price tag. If you were going to compare the Matrixx to an Ozone offering, the Summit UL would be a better comparison. (We did a side by side on the 2 which we will report on later) And from Flysurfer, the Psycho 4 DLX is the closest comparison. In fact the Matrixx 2 is in many ways a dead ringer to the Psycho 4 but better in some ways in our opinion. But with a faster turn rate, easier inflation and lighter bar pressure being just some of the differences. For those who were disappointed with the discontinuation of the Psycho 4 the Matrixx 2 is a more than suitable updated replacement. Stability. Almost everyone who tried it remarked how easy going the kite is yet when pushed it's high performance attributes shined through. The kite has stability to spare. Even in our conditions it handles gust factor like a champ. The kite does this inherently and anything beyond it's natural tendency to manage gusts can be augmented by actively sheeting out as you would most kites. But it does it with surprisingly little effort. The wind ranges on this kite are 7m (16-30kts) up to the 18m (7-15kts) . We find these to be a bit conservative especially in the top end with experienced riders, but they are a good guide for choosing a size. The kite seems very consistent from size to size. The flight characteristics scaled beautifully with this kite. Everyone who's flown it agrees the kite gives a feeling of assurance that it's not going to do anything unexpected. It is really a rock solid wing. Upwind. The upwind ability is good and the kite grinds up wind surprisingly well. Really respectable upwind ability and somewhat close to what you may find in the Lotus. If you can hold your line against the pull you can really get some great upwind progress out of this kite. But it will also rely on the pilot's ability to dial in their VMG. (velocity made good) Lower AR than a race kite but higher AR than a touring wing so the upwind is very good. Turn rate. The Matrixx 2 in the smaller sizes turn fast. Very nimble and sporty. Larger sizes as expected are a bit slower but still faster than most kites in the 15-19m range. With it's lower AR it doesn't seem to suffer wingtip collapse and curl. It has a fairly pivotal turn rate with little loss of elevation. The kite responds well to aggressive steering and really shines with over bar steering if needed. Jumping. The Matrixx 2 loves to jump. Super smooth power delivery and lift. Glides seem to go on forever and it really jumps like a higher AR kite. The larger sizes like 15 and 18m are a little deceptive. In light winds they can generate a lot of grunt. This gives the impression of power and speed but you will find that if you jump in really light winds it's easy to get air and stall the wing. The result, a slow flat drop. But even then, the impact is minimal. Light Wind Performance. In terms of light wind the Matrixx 2 is a true performer. Though not in the same category as A Chrono or Sonic, in non-race conditions the Matrixx 2 is a great light wind kite. And although comparing the Matrixx 2 to Chrono/Elf/Sonics etc. isn't really accurate and very much an "apples to oranges" comparison, the 18m pulls almost exactly like the Chrono 15m. But with a much more user friendly nature and easier set up. Depower and Bar. The kite's power management is excellent. The new bar system has a long throw as well as long trim range via clam cleat. The center leader/trim line runs through an unusual spinner that looks a little clunky but works awesome. Line twists a rare as a result. Aesthetically it may not be as flashy as some other bars but it's functional and reliable. The Matrixx 2 has a brake crossover line for use in landing and reverse launching. Speaking of reverse launch, it reverse launches great. Even the 18m rolls over easily. More often than not, you can partial roll and easily fly it off the ice. The bar is a straight forward, simple set up that works well. They have done away with the 5th line and the HQ Matrixx 2 now uses a 4.5 line grafted into a fly line. When the push away safety is engaged the kite flags off a single front line. 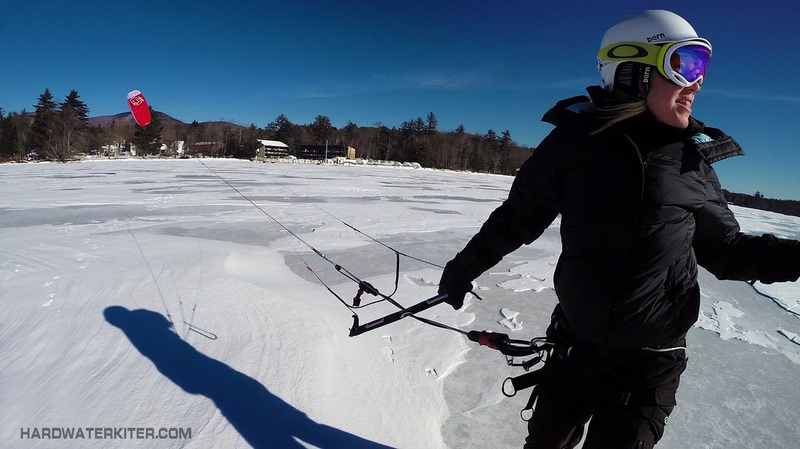 It works but you want to be mindful of the possibility of another line snagging on rough ice and causing the kite to power up after being cut loose. Not too common but a possibility on rough hard plate ice. In those conditions, back stall landing via brake crossover is a better option. We activated the safety system in a variety of conditions. It worked well though as with many front line flag out designs it had the potential to make a bit of a mess in your lines. However it always seemed to look worse than it really was and if you simply fed the flagged out line through it seemed to come back into flying condition with little if any trouble. So in the end of all this we have to say that we are very impressed with the new HQ Matrixx 2. It's a favorite for those who have had a chance to try it and it is truly an excellent kite. The kite turned out to be better than we had expected and it is a joy to fly. If you are looking for a light wind kite the 18m is a great option and almost $1000 less than some of the kites out there intended for use in light winds. I know we want to shy away from comparisons with the likes of Lotus and Chronos but... the 18m pulls like a 15m Chrono. It's worth noting that there is some overlap between the 15m and 18m in light winds. But the 15m turns considerably faster and if you are 180# or lighter the 15m might be a better choice for a broader wind range. And remember. There is a cherry on top. The HQ Matrixx 2 is closed cell and water usable. So you get an all season kite in the HQ Matrixx 2. 2015 Ozone Access and Flysurfer Peak 2 High Wind Test Session. It's amazing what kites can do these days. Over the last decade kite technology has changed dramatically and anyone who began kiting 10-15 years ago can appreciate how much more user friendly and safe kites have become. Especially in just the last few years. Of all the kites out there we have a certain fondness for a couple of really underappreciated kites. Both are consummate touring/teaching kites. Some would label them "beginner" kites but I don't think that is an accurate description as a lot of the local expert riders really like these kites. Both kites do similar things and have similar benefits but come to these similarities from completely different directions and manufacturers. One is the 2015 Ozone Access and the other is the 2015 Flysurfer Peak. Hardwater Kiting uses both models as teaching kites with our students depending on student preference and wind conditions. Really outstanding kites in regards to ease of use and safety. Back on January 16th local Hardwater Kiter and dedicated Flysurfer disciple Paul Morse and I decided to take advantage of a front moving in that would bring some substantial winds and take the Flysurfer Peak 2 4m, a new smaller size of the Peak and a the 2015 Access 6m out for some high wind hi-jinx and see just how well these kites faired in winds a few knots beyond their manufacturer's wind ranges. In typical northern New England inland style the winds had a 100% gust factor and the baseline winds were as forecasted, in the 20kt range gusting to over 40kt. Keep in mind this is 40kts in below freezing temps and the wind is much denser than warm winds and offers a bit more punch. When we arrived to the our launch area the winds were surprisingly calm. Not at all what was forecasted and we were actually feeling a little let down and starting contemplating throwing much bigger kites in the air than the forecast would have dictated. But after being in the parking lot about 10 minutes the front which was running late came through and cam through with a vengeance. Where just 10 minutes earlier we had a clear view 3 miles or more across the lake we now couldn't see the lake just 30 feet away. Gotta love New England weather. Above is a shot of what it looked like all day on the lake. For scale, those trees on the left are about 110' tall. The haze of blowing snow being peeled off the ice was consistently 20-40 feet high. At times I could only find Paul by his kite over the haze. We half nervously laughed at the sudden turn in weather and how the air around us seemed to boil with the mix of gusting winds and swirling snow. Paul and I have flown in conditions similar to this in the past. There are very few snow kiters that I can ride with in this stuff and feel confident that they will be okay. Paul is one of those kiters. He and I have gotten caught in winds like this in the past and fought our ways back to our launches but it's rare we start out in these conditions. These are the kind of conditions we had in mind when there was talk last season of a smaller Flysurfer Peak. After last season's test session on the 6m Peak 1 in 40kt+ we thought a 4m would be awesome . (Though at 4m the Peak is more like a 6m traditional foil in our opinion, it seemed like it would make for a great "high wind" (34kts+) kite for heavier riders like myself or expert riders in general.) Although it's listed max wind speed is 28kts, our history with the Peak 1 has shown that in the right hands these Peak single skin kites can operate well beyond their posted wind ranges. The other kite we wanted to take out was the 6m 2015 Access. We want to note that the 2014 Access was a great kite. We were really impressed with it's depower range and unwavering stability and gust handling. The 2015 has retained this performance and now has the added safety and convenience of Ozone's new internal "Re-Ride" safety system. A system that not only does an amazing job of killing a kite when needed but also doubles nicely as a "set up/Pack down" system. One that puts set up and pack time very close to that of the Peak, which is one of the best things about the Peak series. The first kite we set up was the 4m Peak 2. As soon as you set your anchor the shifting snow buried it. You set anything down in these winds and it was immediately buried. 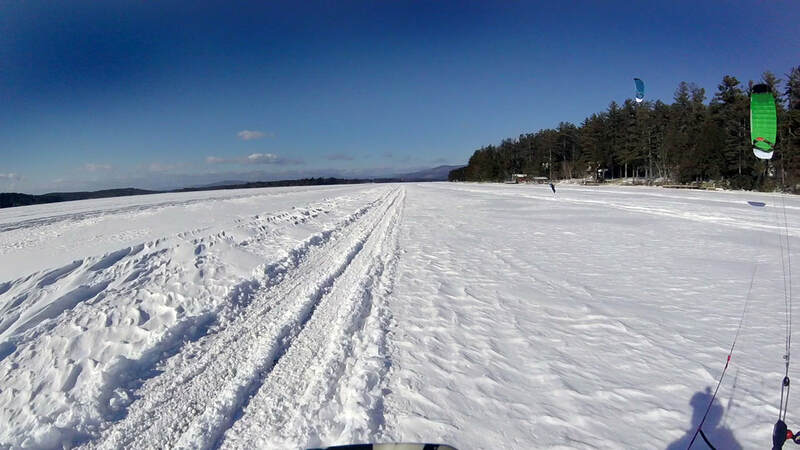 As the heavier rider I am the default test dummy sent out to get a taste of what the winds are doing out on the ice. We set up the Peak, I hook in, launch and off I go into the haze. As expected the Peak takes the punches of wind like a prize fighter and though I'm totally lit and can feel the gusts I need only to sheet out and dump the power that the gusts are forcing on me. Of course in these conditions there is no use for the stopper ball. You are sheeting in and out some rapidly and so far the stopper becomes a hindrance. Save the stopper for the cruiser days. The Peak felt fast. In this wind everything feels fast but this 4m seems to like sitting a bit forward in the window and urges you to run with it. It is crazy nimble and fun to fly in this wind. I trimmed out and as expected the kite depowered nicely. The steering in full trim is heavily lagged but really I can't see a need to fully trim the Peak. Honestly even in 40kts, in my weight there was no need at all. And as always, reverse launch is easiest on the Peak. In a matter of seconds I was out about 1.5 miles. I looked back through the maelstrom around me and couldn't see any sign of Paul, our launch or even shore. I flew back to my anchor and gave the Peak to Paul. He launched and disappeared only occasionally could I see him in the gaps of haze across the lake. A calm spot out of the wind during a relatively calm moment. After a few minutes of watching Paul rage along on the 4m Peak 2 I set out to get the 6m Access up. We have been playing with the Access and the new Re-ride system. The last time I had the 6m in the air we used the Re-ride system to make land it and the simply secured the bridles to velcro keeper on the trailing edge and simply (and neatly) balled up the kite and stuffed it in the pack. The theory being that it should come out just as it went in and with the bridles secured there shouldn't be any issues. I'm happy to report that it unpacked just fine. I simply pulled the bar out of the bag, unwrapped the lines, secured the Re-ride line, pulled the kite out of the pack walked back reset the Re-ride and launched. Super fast and easy. The 6m pulled me at 210lbs in those winds beautifully. Unlike the Peak the Access was managing the gusts without much if any input from me. Much like the Peak, the power management in the bar throw was perfectly capable of dealing with the 40kt blasts. Unlike the Peak the Access turn rate was quite a bit slower. Not bad but not nearly as "sporty" as the Peak. One of the most remarkable aspects of the Access is the stability that the kite possesses. It really is unreal and I won't even try to explain or compare it to anything else because to be honest neither myself, or Paul after he got on the Access, could believe the stability. While Paul was playing on the Peak 2 4m he was constantly piloting the kite. Meanwhile I'm so relaxed and confident that I'm able to set the kite at the edge of the window, take both hands of and mess with taking shots with my phone. After about an hour and a half of riding various sections of the lake Paul and I landed in a wind shadow and swapped kites. I took off on the Peak 2 and after riding the Access it was a stark difference in how it felt and handled. The bar pressure was considerably higher than the Ozone. The 4m had a bit more power than the 6m Access and the delivery of that power could be smooth or abrupt depending on how you sheeted in. The Peak 2 is not nearly the friendly cruiser the Access is but it is a lot of fun to fly. The nice thing, about the Peak is that even with the higher power you can still ride with little to no worry of getting lofted or yarded. But it is definitely more work to fly than the Access. After about another half hour or so Paul and I met up to compare notes. Like myself, he was amazed at the stability of the Access. While he was playing on the Peak, at times fighting with it, he noticed how easily I was cruising around and how stabile the Access was. After taking it for a ride he understood why. A little while later I decided to pack up the Peak 2 and switch to the 8m Access. Not because I didn't want to continue to ride the Peak but because I figured I never felt the 6m had too much power and in the 20kt lulls, I actually felt borderline underpowered. So my thinking was take the 8m out and see how it handles trimmed in 40kt gusts. It was great! Really, surprisingly good. It felt very close to the 6m. In the heavy gusts I trimmed it out about 2" but only because I was tired and not really interested in fighting the kite if I didn't have to. As a high wind kite for a heavy experienced rider the 8m is passable but not ideal. It's not as suited for high winds as the 6m but even when I screwed up, got too close to the tree line and had to redirect to a spot that that any other kite would have lofted me. The Access let me know but it didn't smack me down. And I was thankful. A clear spot. Paul in the distance. So I guess the bottom line is this. As expected, both kites were awesome. Both have their pluses and very minor "minuses" and those are really dependent on your personal tastes as much as anything. In high winds Access is going to be a joy to ride for anyone regardless of their high wind experience. The Peak 2 is more pilot dependent and for experienced riders and especially for snow kiters familiar with flying the Peak 1. It depends on what you want for a kite and for flight quality and obviously the Access has a refined quality while the Peak is more "get the job done" utilitarian. The Access is like a nice road car while the Peak is more Jeep-like. Again, we are talking Apples vs. Oranges in terms of kites and design. But very juicy and tasty apples and oranges. Much of what makes one kite "better" than the other mostly comes down to personal preference, budget and usage. But really you cannot lose with one or both of these kites in your quiver. For some idea of what the conditions were like here is a link to some of the footage shot that day. 2/12/2015 Note. There has been some speculation and question about how the HQ Apex IV would fair in this comparison. Hardwater Kiting has been both using the Apex IV for school kites and selling them for the last couple of seasons. The Apex has always been a great kite for the money both as a first depower and as a high wind kite. With the delay in release of the Apex V and with our experience with the Access and Peak kites last year we opted not to continue with the Apex series this year as our open cell school kites. Though the kite is not bad in our opinion it has fallen behind in both performance and safety systems compared to the kites we covered in this write up. The Apex falls way short on the gust handling of these newer kites and the top hat safety system is out of date and sometimes largely ineffective in the conditions that this write up was conceived in. This does not mean that the Apex IV is a bad kite, just not up to the same levels of performance or standards that these newer designs have achieved. We are looking forward to seeing what the Apex v has to offer. If the Matrixx 2 is any indication we suspect Apex V will be awesome and continue to offer an affordable touring/beginner kite option for those that may not want to spend the extra $$$ for Ozone but want something more traditional in design than the Flysurfer Peak. 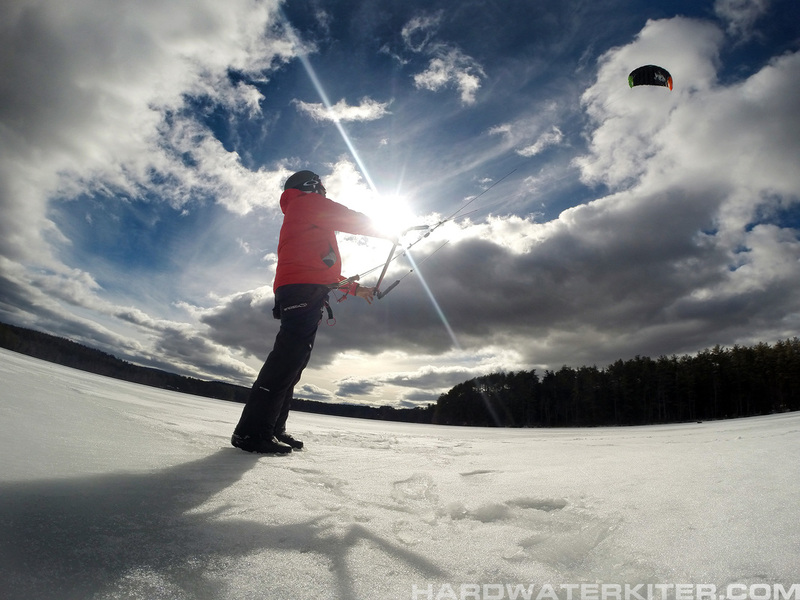 Hardwater Kiting: You will not find reviewers with more depower foil experience anywhere. ​These reviews are non-brand biased and based on our first hand experiences and those of our customers. ​The reviews are intended to educate and help kiters make the often hard decision of which kite to spend their hard earned dollars on. If there is something you'd like to add or may concern you about our reviews please make a comment. Any feedback is welcomed and greatly appreciated. HARDWATERKITER.COM so we can make a living, keep the lights on, feed the dogs and continue to offer what many think is a valuable service.